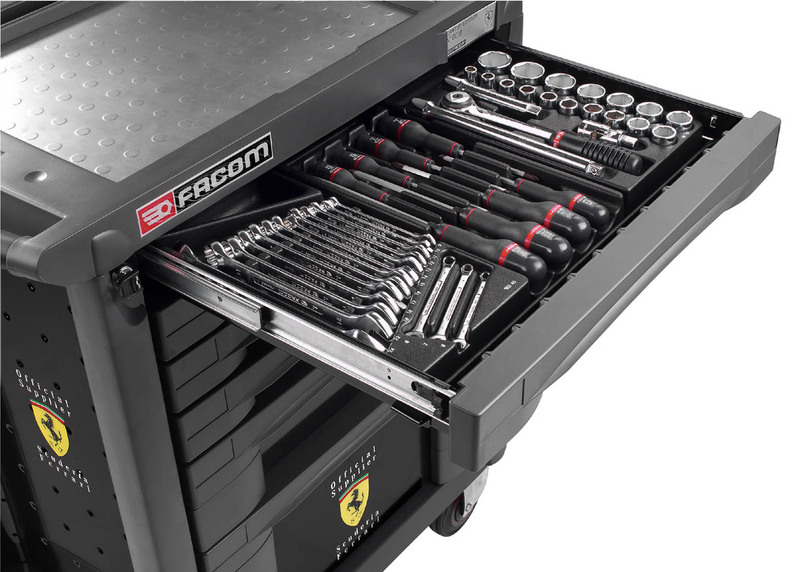 Facom, USAG & Ultimate Garage - Ultimate Garage has been selling and supporting the Facom tool line since 1997 and is the largest distributor of Facom in the US today. Facom offers an extensive range of tools in support of multiple industries and trades....Automotive, Electronics & Microtech, Industrial, Aviation & Aerospace to name a few. Over 4,000+items are in stock for immediate shipment and most can be ordered through the Online Store. Special order items and quantities not in stock typically take 2-4 weeks to arrive from Europe. In January 2017, my supplier of Facom for the past 6 years was purchased by a company outside of the Stanley Black & Decker Group. As a result, they were no longer receiving the "inside pricing" on Facom and my costs increased dramatically. This higher pricing combined with their "no warranty" policy on Facom products forced me to look elsewhere...........to USAG. The lines between Facom and USAG have become increasingly blurred. I'd estimate that 60%+ of the USAG products are rebranded Facom items (or vice versa). For example, the Facom 151/161 series round head ratchets (mentioned below), 84TC T-handle hex drivers, and most of the Facom torque wrenches are all manufactured in USAG's Gemonio plant in Italy. .
USAG 516/518/519 tool trolleys are rebranded Facom Roll/Chrono/JET series tool boxes made in France. In 2017, I began switching some of my Facom inventory over to USAG. Most of the products are identical (other than the brand name on the tool) but pricing is typically 10-30% lower for the USAG branded tool. As a direct USAG distributor, I receive direct factory warranty support. I'm not saying "arrivederci" to Facom as they still offer many items not available through USAG. Customers will now have a choice and access to another quality European brand that has been poorly represented here in the States. 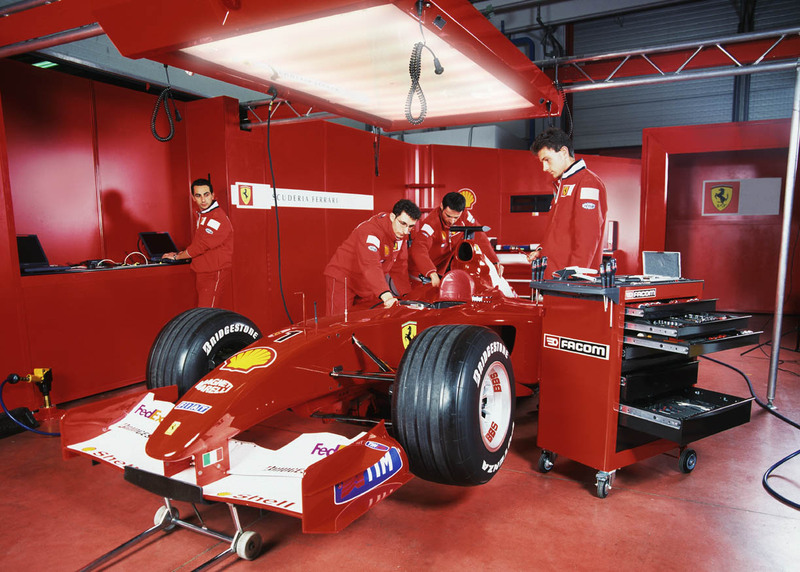 USAG is the tool of choice at the Ferrari factory in Italy. They are also technical partners with both the Ducati MotoGP and Toro Rosso F1 race teams. I personally inspect 95% of the incoming Facom & USAG purchases for damage, blemishes, shortages and mispacking. Outbound shipments to my customers are carefully packaged and protected to minimize the chance of shipping damage. Most items ship within 24hrs at a $10 flat rate cost anywhere in the US. 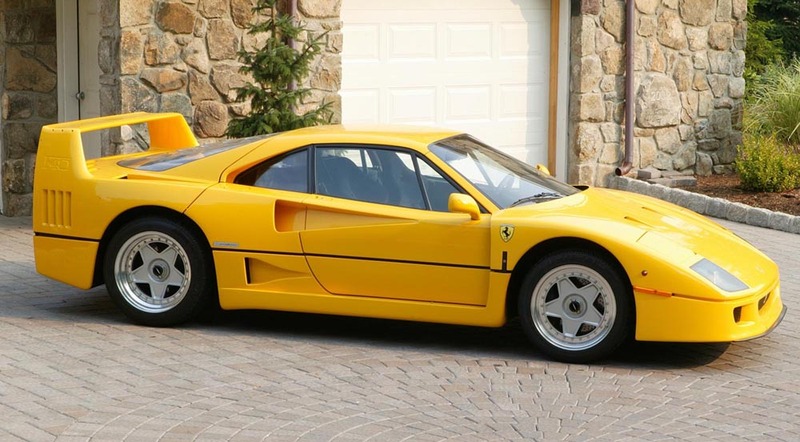 Facom/USAG Master Inventory & Price List (Ultimate Garage) - I try to update this list a few times a month with the latest inventory count and pricing. 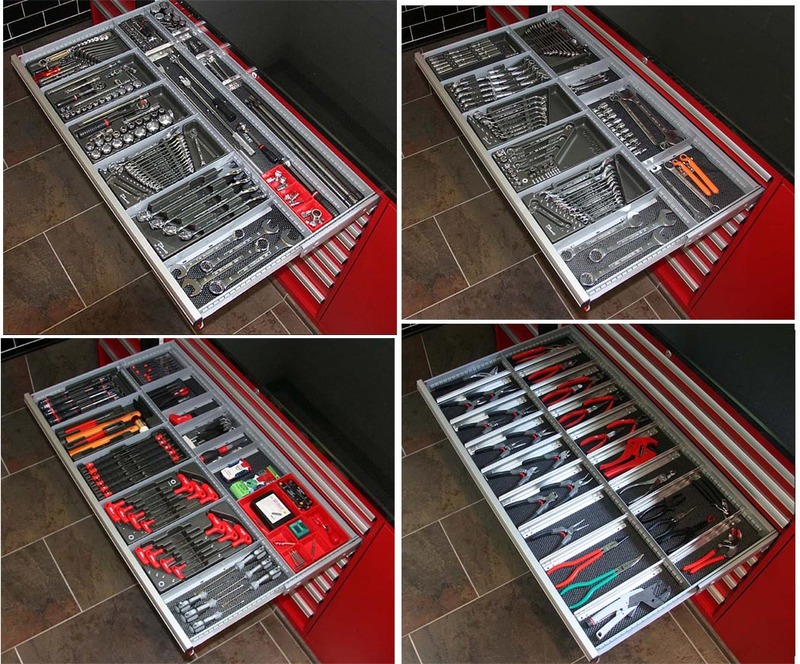 If you are a Tool Reseller, please contact me via email ( ultgar@verizon.net ) for an Excel price file with additional discounts for volume purchases. Facom/USAG Tool News will highlight new and featured products, "Facom classics" & company history, pricing and trends, tools in action, and tool reviews from my own personal experiences. 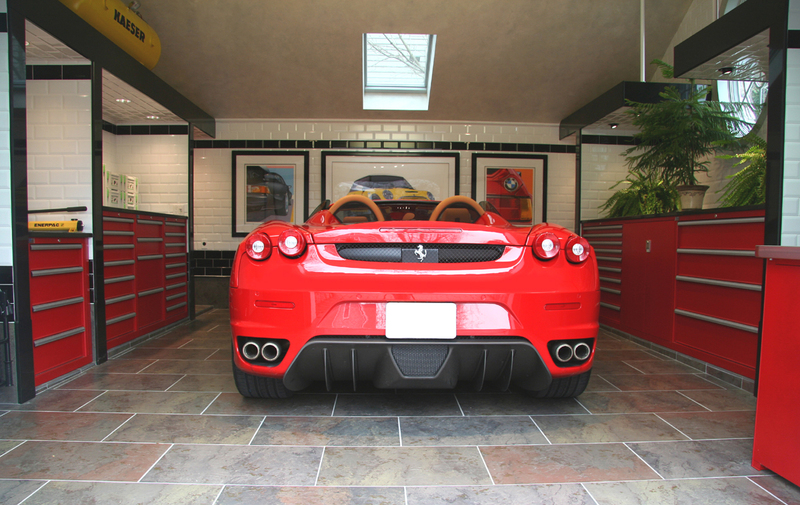 Plenty of car and shop photos from my past 20 years of designing and outfitting garages and workshops. Additions & Corrections - Please let me know if you find any errors or inaccuracies and I'll update my postings as required. Also, if you have any good photos of Facom or USAG tools in action or of a well stocked Facom/USAG workshop, I'd be happy to add them to this newsletter to be shared with other enthusiasts. Drawers 1-4 are all 60mm deep and suitable for the use of USAG or Facom module sets. All drawers come with liners. 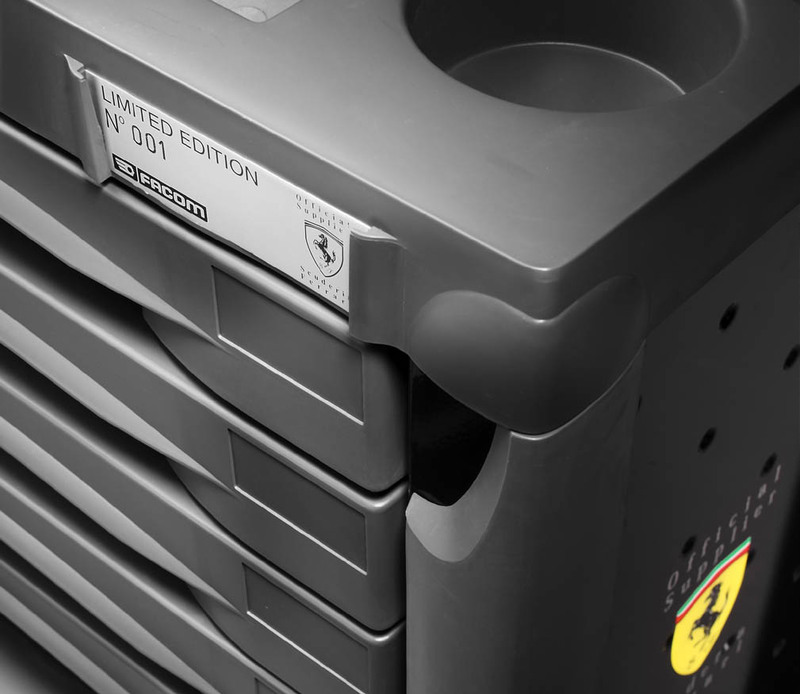 6/01/18 - Facom Ferrari Collector Set - In 2001, Facom was named the official tool supplier of Scuderia Ferrari. 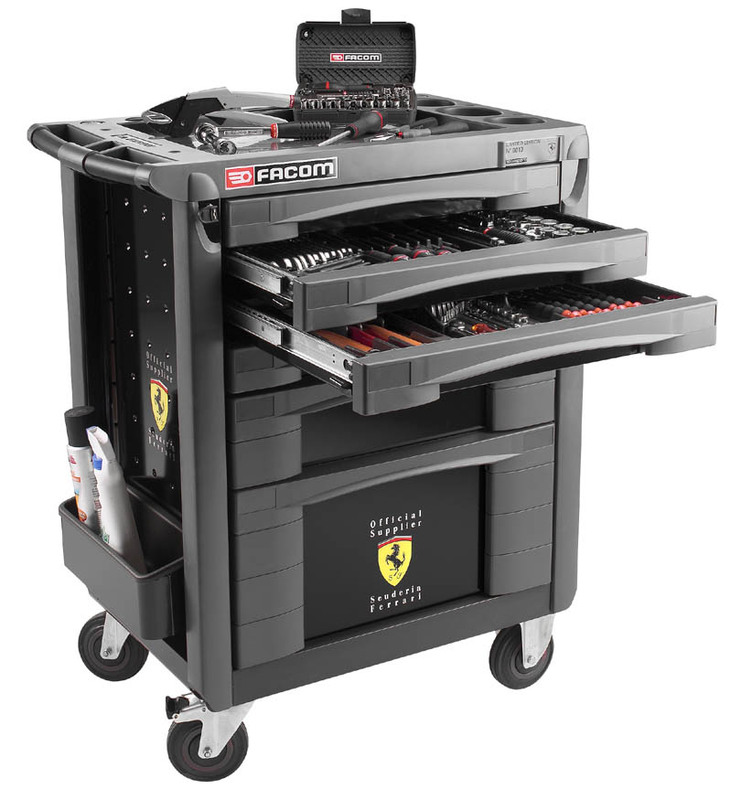 In commemoration, Facom released this limited edition 129pc master tool set, housed in an attractive 6 drawer portable workstation with Ferrari logos. 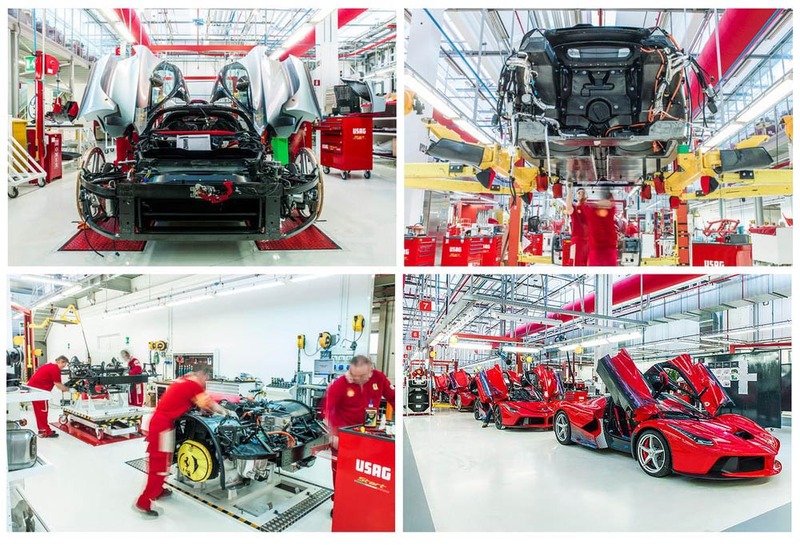 Ferrari restricted production to 1,400 sets worldwide, 15 sets given to the Ferrari factory and 1 set to their extraordinary driver, Michael Schumacher. The United States allocation was 200 sets. 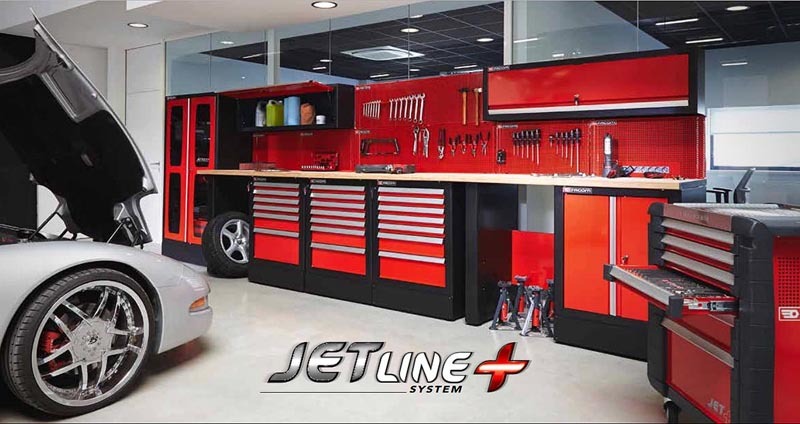 The current JET series boxes and module tool sets have come a long way since 2001. There's still a lot of demand for this set which pops up on Ebay and other classified's from time to time. I still have most of the original tools that were part of this set. Here are some pics of the original 129pc set, serial #001. Punches were removed from the original cardboard packing, cleaned & oiled, checked for operation, supplied with operational drawings, and bagged for sale. Very time consuming! 2/10/18 - "Almost Free" Ratchet Maintenance Kits - for the new Facom 161B series and USAG 237A series high performance ratchets. Limit one per customer for each ratchet purchased through Ultimate Garage (by itself or in a set). The "master sets" typically retail between $20-25 each. Note- screenshot pricing for display purposes. Pricing subject to change! 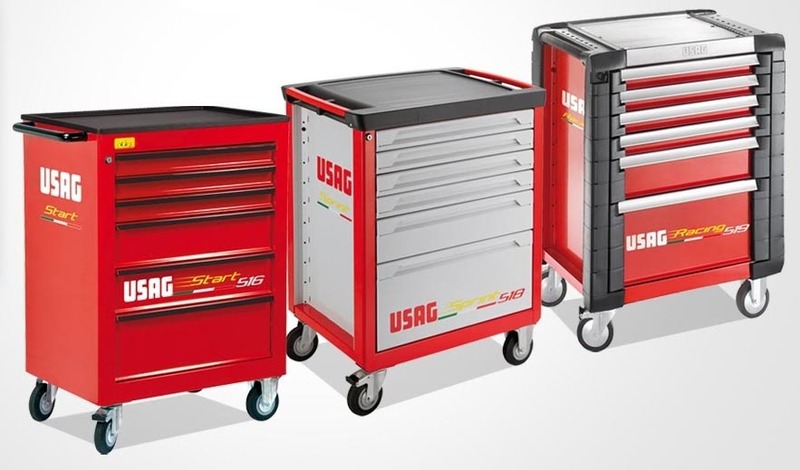 2/01/18 - Ultimate Garage Online Store (Facom/USAG) - Facom and USAG tools have now been combined in a single category in my online store. Identical or similar products are now listed side by side (see below) so customers can make their decision on pricing, photos and specifications. 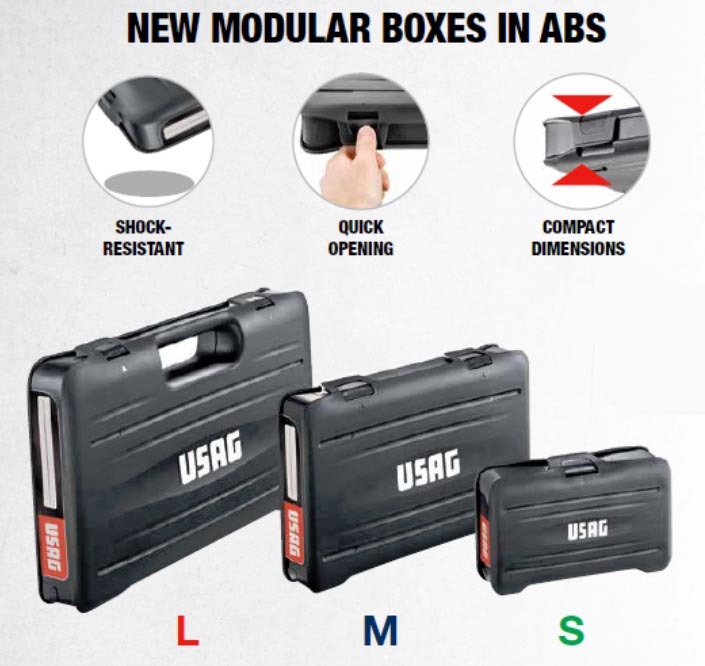 Most USAG products are listed by the Facom part number in the product description & title (eg, S.161B-USAG) with the USAG number (eg, U02370106) listed as the part number so it can be tied back to the USAG factory online catalog. Note- screenshot pricing for display purposes. Pricing subject to change! 1/25/18 - Facom Modules in a Custom Lista Mobile Cabinet - I configured this one as a product display for both Lista and Facom...a Lista MW600 cabinet with a mobile base and a custom skirt to hide the 4 swivel casters. With 4 swivel casters, this 400+ lb cabinet (before tools) can easily be pushed straight back to the wall when not in use. The top 4 drawers are full extension, 3" deep. 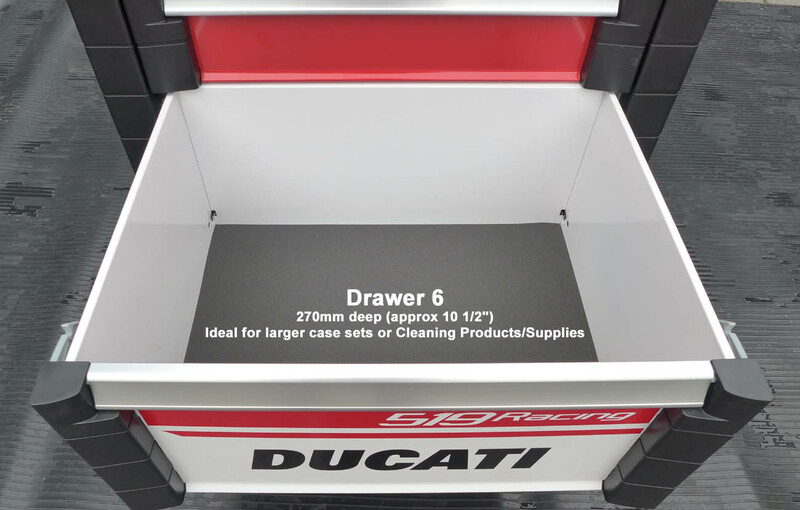 with safety latches (IDL's) to prevent the drawers from accidentally opening during transport. 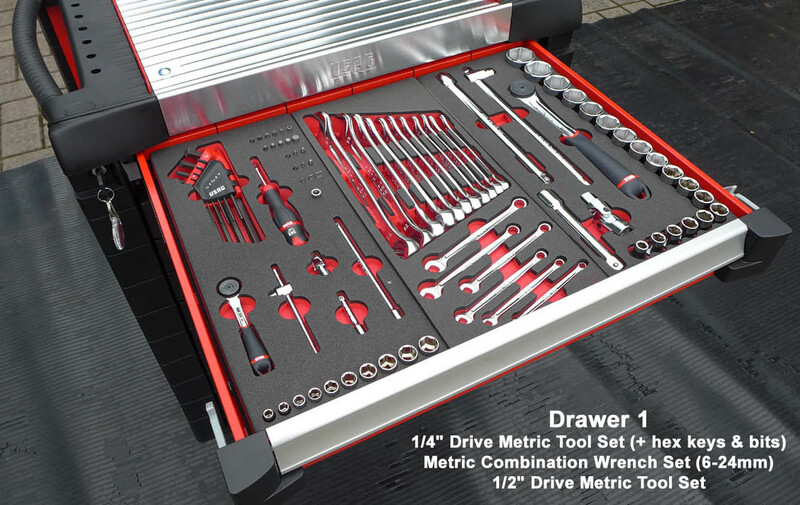 The drawers each hold 6 Facom/USAG standard-width modules with plenty of room in the back to be partitioned for additional tools and accessories. Note - this was done about 10 years ago....most of the modules in the photos are no longer in production. Facom now has well over 100 plastic tray module sets and plenty of bi-color foam tray sets which didn't exist when I put together this display. 2/10/17 - Classic vs Current Screwdrivers - in the 20+ years I've been selling Facom, there have been 3 popular series of screwdrivers..... Ergotwist (with the red handles) from 1996-2002 (approx), Enduro (with the black handles) from 2003-2005, and Protwist (black with color inserts to differentiate type of screwdriver) from 2006 to current. One thing I've noticed with the Classic screwdrivers is a tendency of small gaps to form between the top cap of the tool and the main body. This is normal and found in most of the Ergotwist & Enduros I have left in stock. The newer Protwist handles (Facom/USAG - standard & insulated) appear to be sealed and should not show any separation or gaps. 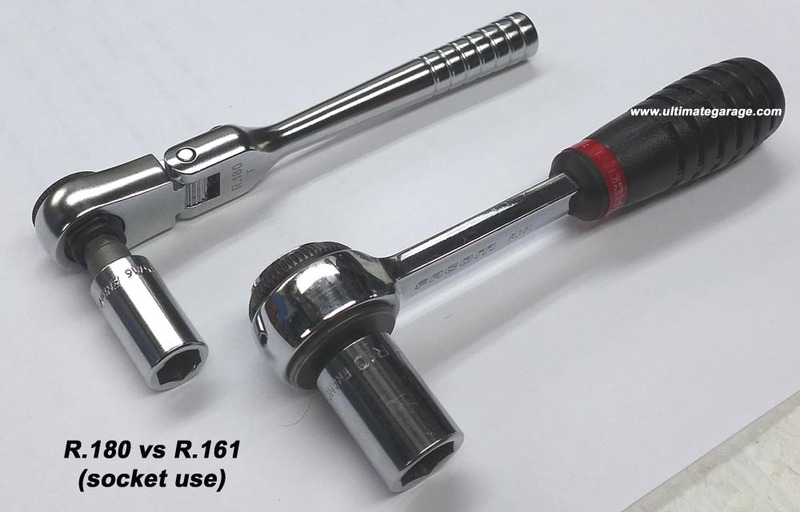 6/01/17 - Facom/USAG New Round Head Ratchets - One of the most important introductions in recent years has been the Facom/USAG new line of high performance sealed ratchets (R.161B, J.161B, S.161B and K.161B). 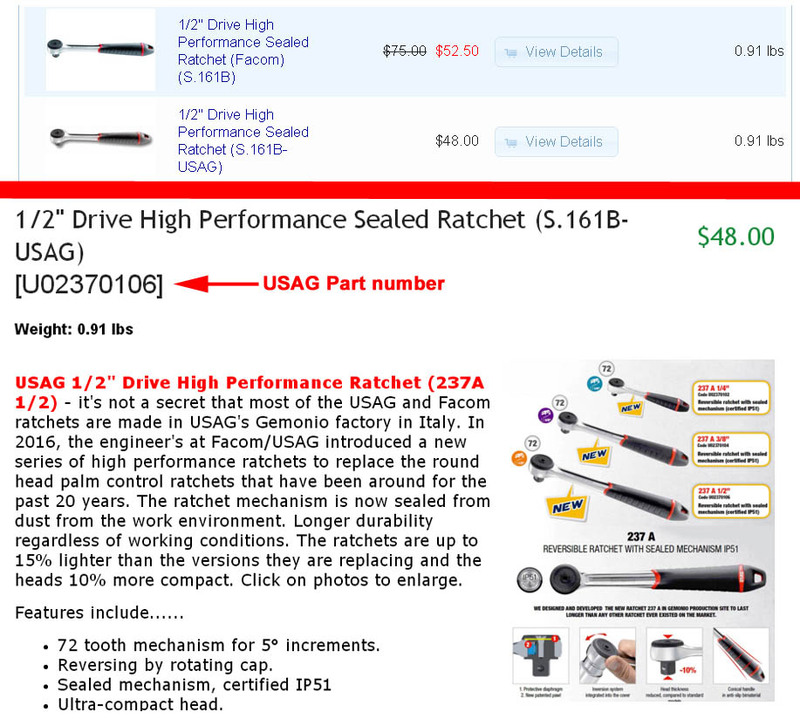 These ratchets were designed & manufactured at the USAG factory in Gemonio, Italy and are available in both Facom (161B series) and USAG (237A series) branding. This is the first major change to the 161 series ratchets in 20 years. The ratchet mechanism is now sealed to dust from the work environment offering longer durability regardless of working conditions. 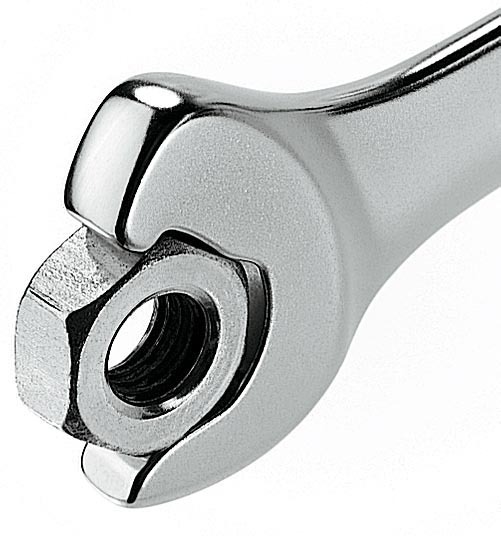 This ratchet is 15% lighter and the head is 10% more compact than the ratchet it replaces. The handle is SLS compatible (Safety Lock System - hole in the handle to secure the tool with belt accessories & lanyards when working at heights or locations where dropping the tool would be highly undesirable). One of the major problems with the older 161 palm control ratchets was their requirement for periodic maintenance and lubrication. Without this service, the grease in the ratchets would dry and the mechanism would seize or slip. 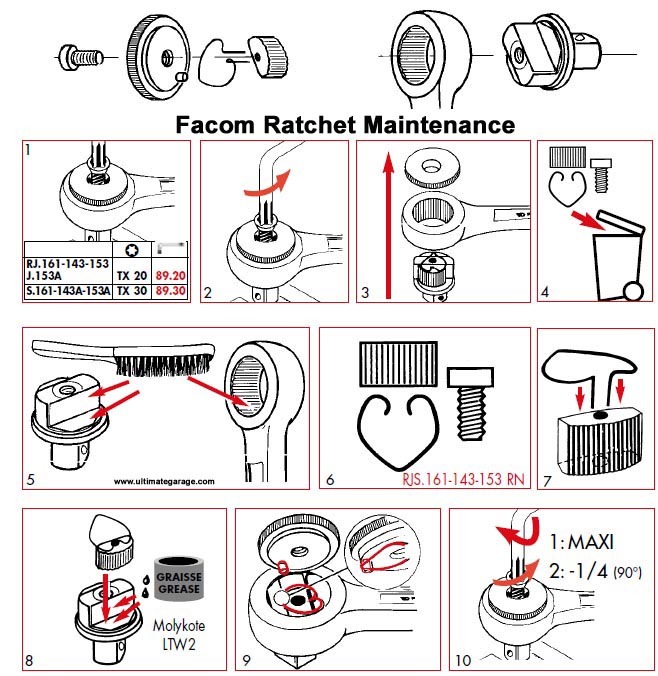 Facom is moving towards low maintenance (no maintenance) with all of their ratchets. 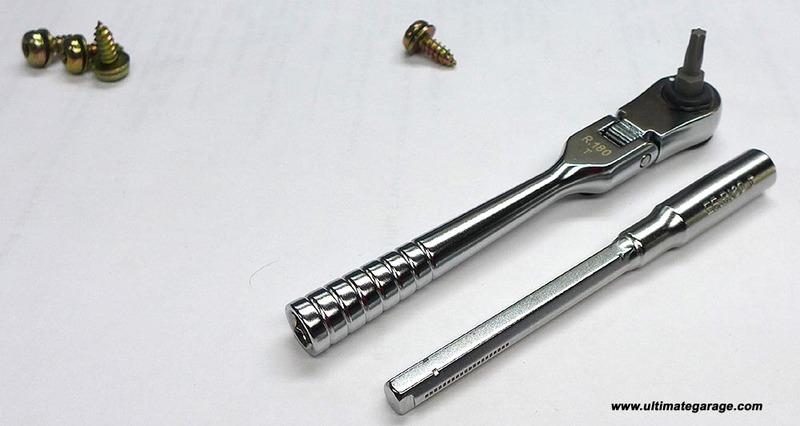 Repair kits are not even available for the Taiwan produced "pear head" and "rotator" ratchets. 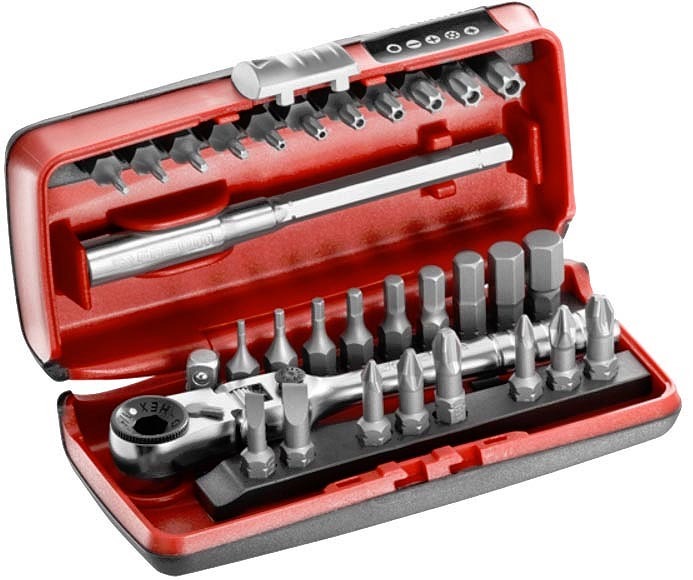 One of the major impacts of the new ratchet series (151B and 161B) is the discontinuance of 100+ module and case tool sets. 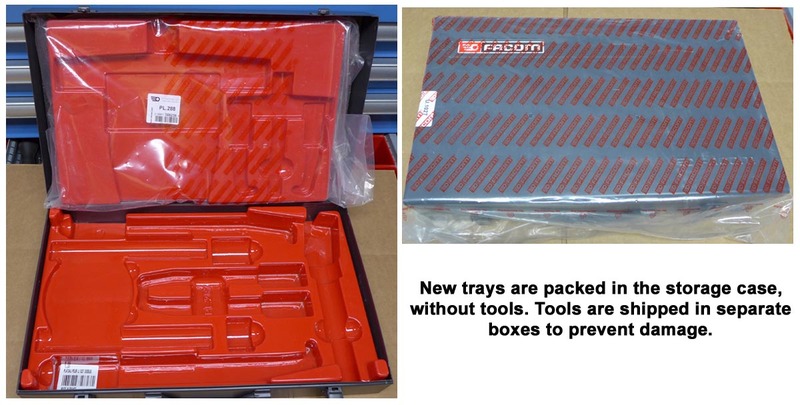 With the change in ratchets, Facom has also introduced a new line of modular tool cases (BP.MBOX......small, medium & large) to replace the older BP.102/BP.109/BP.112/BP.115 tool cases. 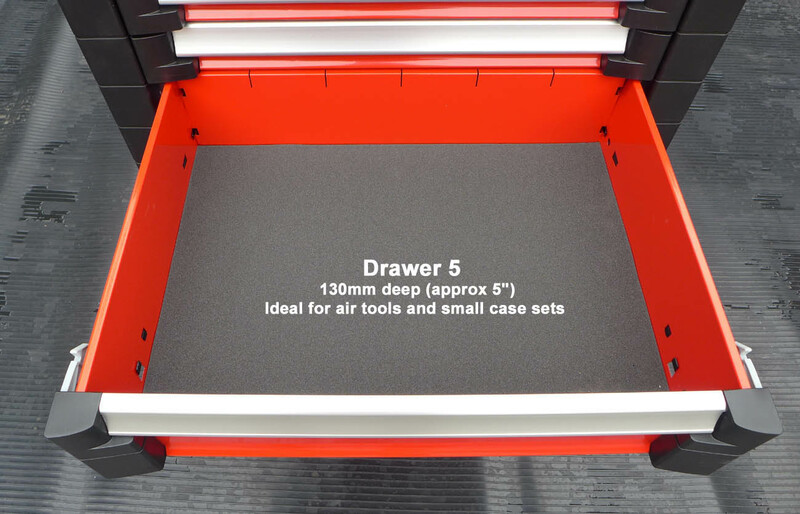 The modular cases and module tray dimensions work well with the ergonomics of the JET toolbox drawer interiors. 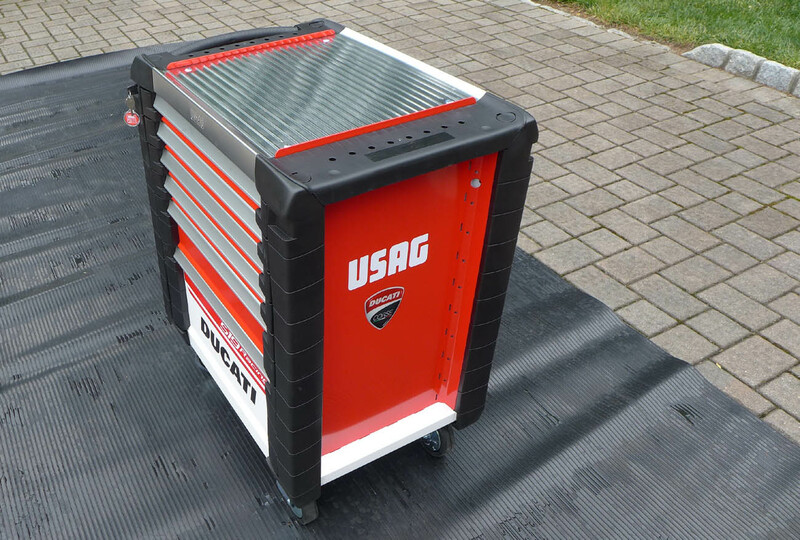 USAG also began using the new MBOX cases for the tool sets in 2017. 12/26/16 - "Classic Facom" Section in the Ultimate Garage online store - I've created a section in my online store for pre-2005 Facom tools that have been discontinued. This is before the Stanley takeover and just about all of the items were made in France (the CDX ratchets were made in Italy). 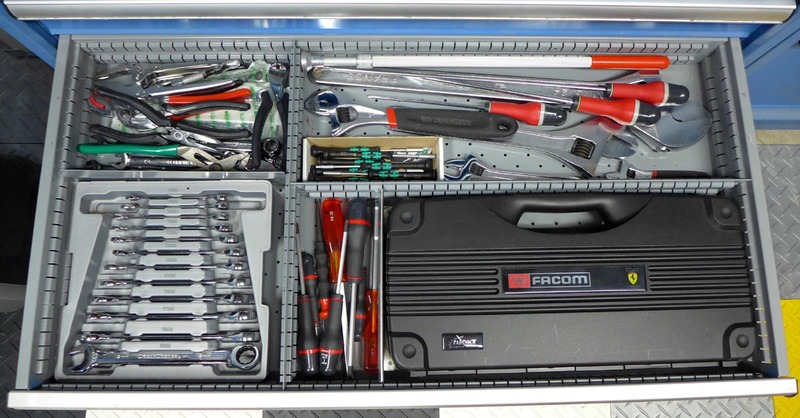 Tool collectors are looking for "French" Facom only and others may have a lost or damaged item in their tool box that needs replacing. Quantities are limited to supply on hand. If you have any questions about any of the listings (especially some that were recently listed without photos), please send me an email ( ultgar@verizon.net ). 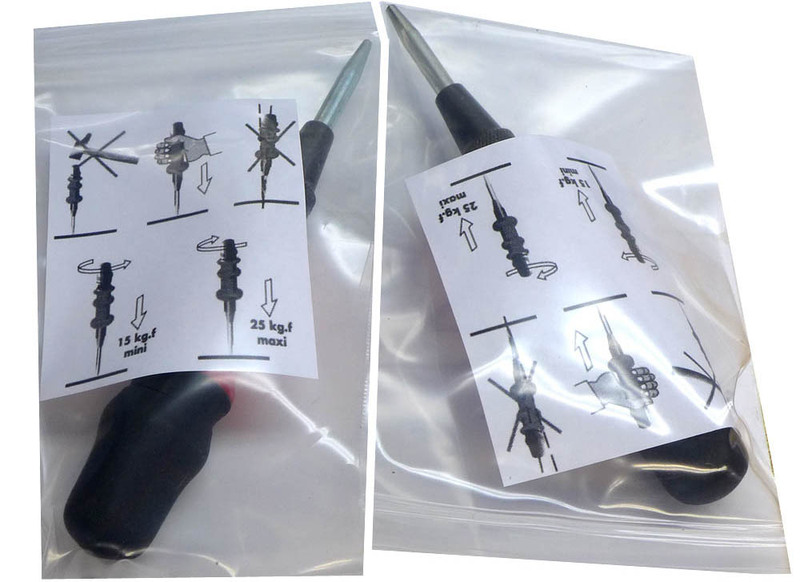 10/15/16 - Packaging Change-Facom Pliers - Facom has started packaging their CPE Series and 500A series in plastic bags. The previous paper boxes did not hold up very well in shipping. This is a welcomed change. 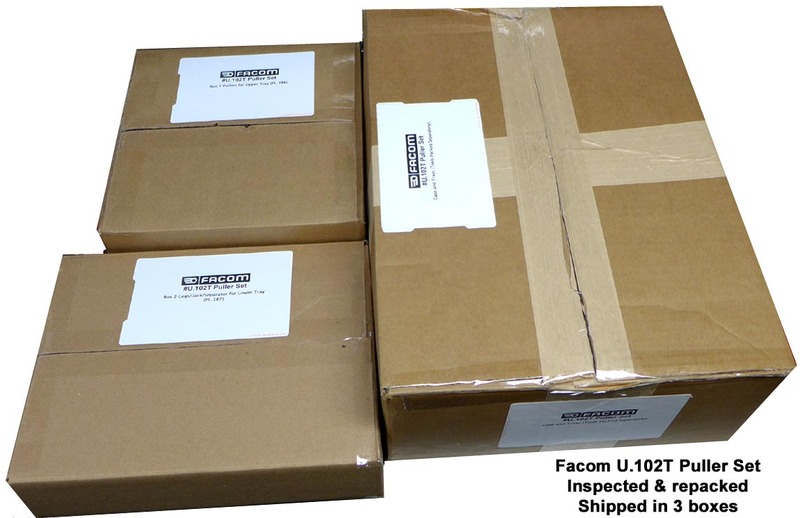 8/29/16 - Packaging Change-Facom Microtech Screwdriver Sets - not exactly earth-shattering news but Facom appears to be departing from their old light grey color cases used with their Microtech screwdriver sets. The latches and case dimensions appear unchanged. If you're nostalgic for the old grey cases, better get them while you can. The new ones will be black. 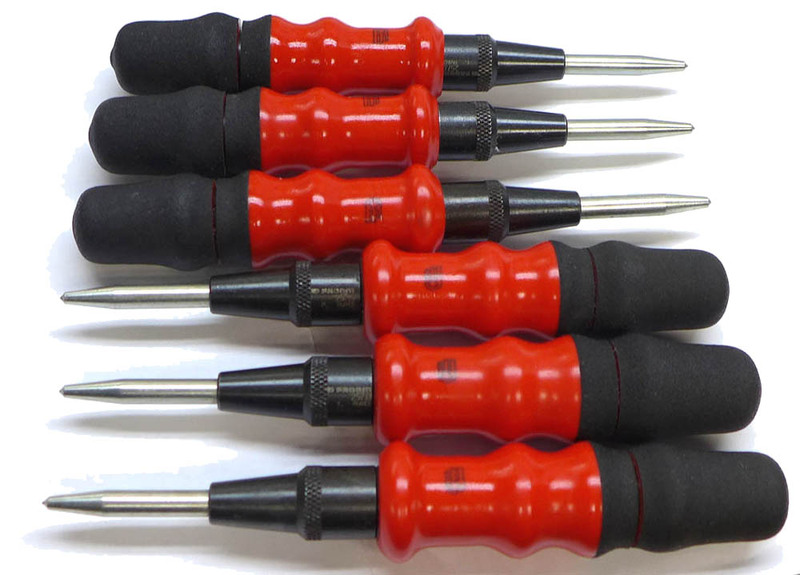 Facom AEF.J3 (slotted & phillips screwdrivers). New black case in 2016. 8/22/16 - Facom Plunger Lock System (for sockets & drive accessories) - Facom uses a quick release plunger-lock system for safely securing their larger 3/4" and 1" drive sockets and accessories. Conventional ball detents on ratchets and extensions cannot hold and secure the weight of these heavier tools. The pin and plunger release (see photos below) must be aligned for the system to work. For impact use, safety pins & o-rings are the best way to secure sockets and drive accessories to impact drivers. 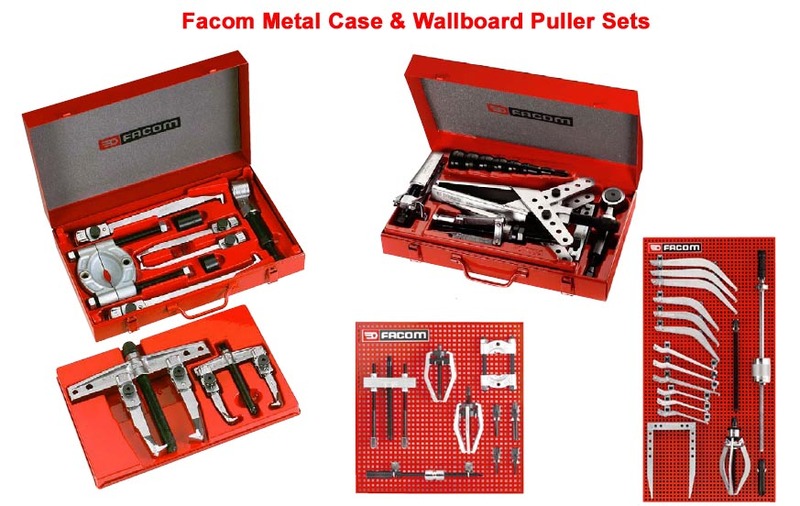 8/15/16 - Facom Tool Modules & Replacement Trays - Ultimate Garage has the largest selection of Facom tool modules in stock this side of the Atlantic, both with the classic thermoformed polystyrene tool trays and new multi-layer foam trays. 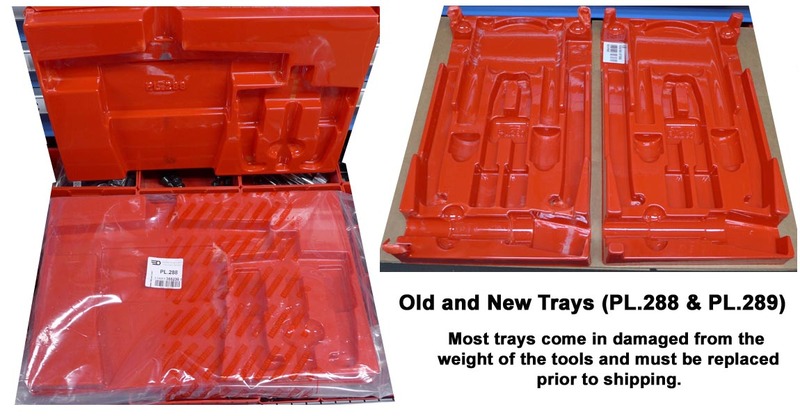 We also stock a large selection of replacement trays to replace broken ones or to reorganize your current Facom tools and sets for module storage in toolboxes and workstations. Here's a Quick Product Listing of current module & tray inventory with pricing, weights and other important details. 6/15/16 - Facom Puller Sets - Facom produces a wide variety of pullers and sets for automotive and industrial applications. 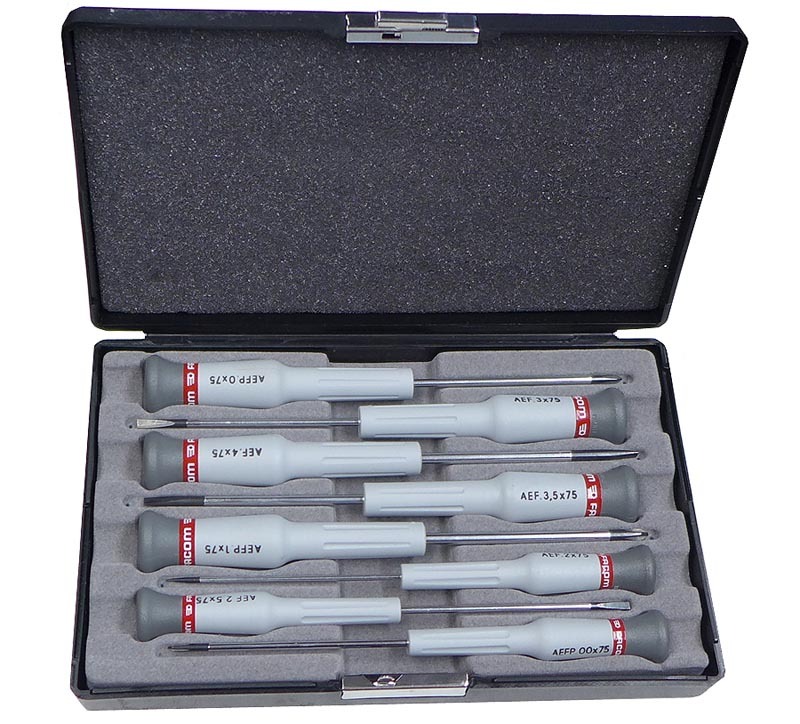 Some of the more popular sets, U.102T and U.103A, come in metal cases with plastic trays. Unfortunately, due to the weight of these pullers, the cases and more often the plastic trays are damaged in transit from France. Since this happens to just about every U.102 and U.103 set I purchase, I now order replacement trays with every kit. The sets are thoroughly inspected, checked for "issues", and repackaged. I can't imagine any of my competitors going through this process with the sets they sell. 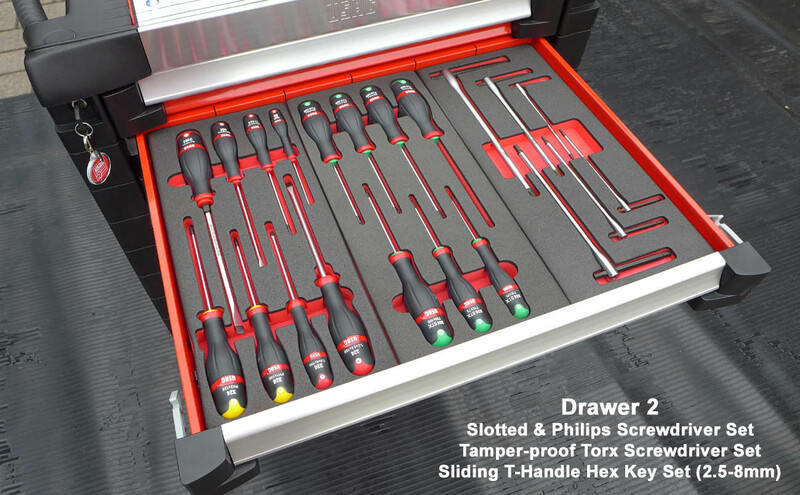 The U.102T set is sent out in 3 boxes instead of 1 (tools separated from the delicate storage trays) and the U.103A set is now sold in a heavy duty DeWalt storage case. Facom needs to address this problem by separately packing the pullers and accessories from the trays and cases...........or come up with a better storage system for these multi-puller sets. 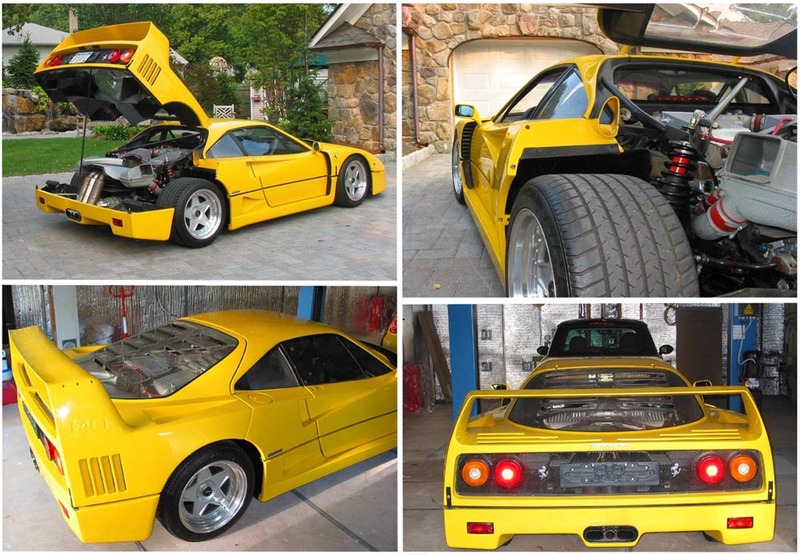 6/05/16 - Facom Tools in Action - Ferrari F40 service (oil & plug change, oil pump replacement) - car came in with the oil light on. Main pump replaced, oil and plugs changed. 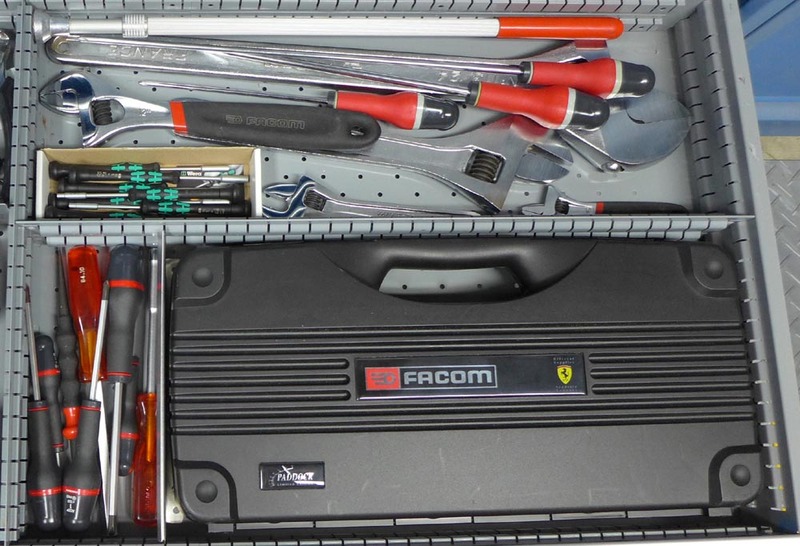 Tools used were all part of the Facom/Ferrari collector set. 1. You can milk a cow a thousand times but you can only slaughter it once! Treat customers fairly...offer the best service, best pricing, best support and you'll keep them as customers for years to come. 2. It doesn't matter how much money you make, its how much you keep! Manage your costs and keep pressing your suppliers for better pricing. Pass these savings onto your customers. 3. Fast and cheap delivery.....while I can't offer free shipping (nor do I charge a $100 annual buyers club fee, eg, "Amazon Prime"), 99% of my products ship for $10 flat rate and most via USPS Priority mail with 1-3 day delivery anywhere in the US. 6/05/16 - Facom Retail Pricing - I worked for the IBM Europe/Middle East/Africa Group (E/ME/A) back in the 70's and 80's as an accountant and financial analyst. Each country had its own IBM subsidiary (eg, IBM France-706, IBM United Kingdom-866, etc) and they were free to set their own pricing for products and services. 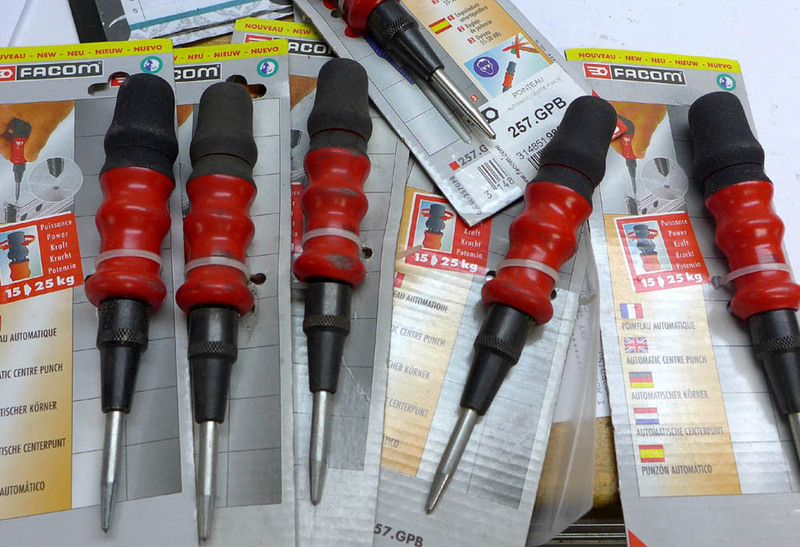 With Facom tools, I work with 3 sets of retail pricing......Facom UK (GBP- £), Facom France (same as the rest of mainland Europe, Euro-), and the Stanley-Proto pricing (US-$). 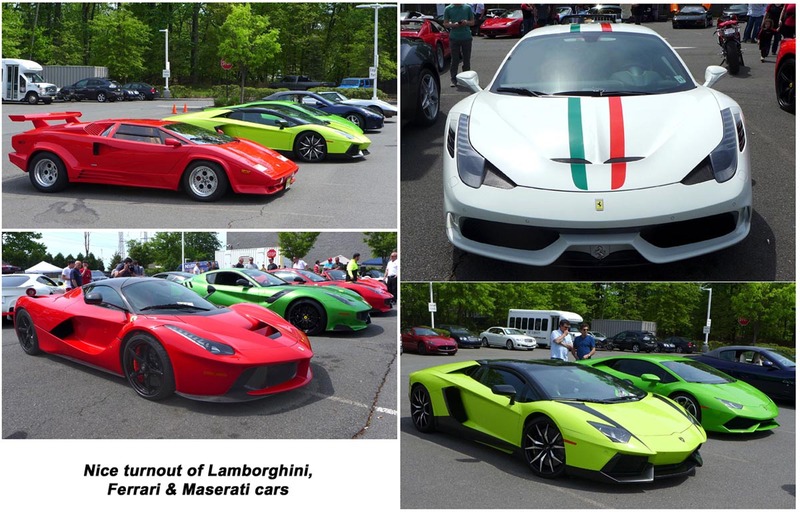 The pricing can vary significantly among the 3 groups. All consumers (product resellers, corporate buyers, tool dealers/distributors and end users) can easily use Google to compare pricing on a global basis. Although retail pricing is interesting, the only thing that really matters is landed cost (product cost + taxes + customs & brokerage fees + shipping and handling). 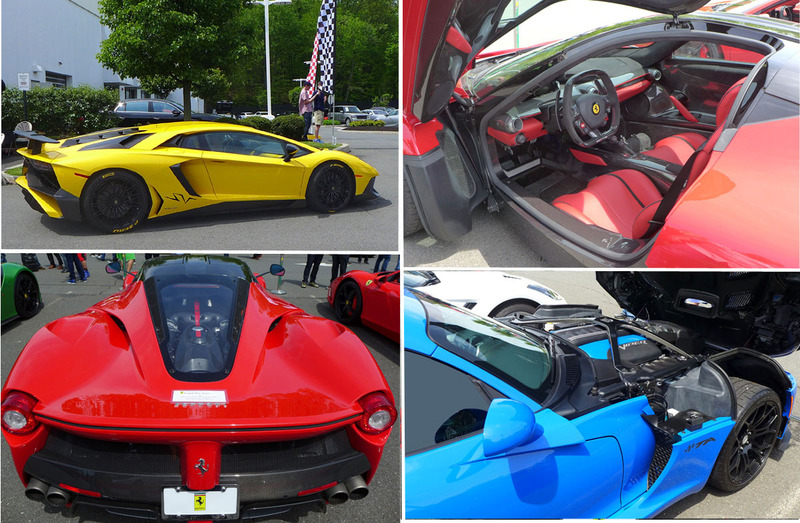 While retail pricing is often 10-25% lower in France, the discounts are far better from dealers in the US and UK. As a Facom tool distributor, I track pricing on an item by item across currencies and try to ensure that my pricing (ie, your "landed cost") is lower than my competitors. 6/04/16 - My Facom/Lista Workshop - when I left IBM in 1994, I built myself a garage workshop to work on my cars. 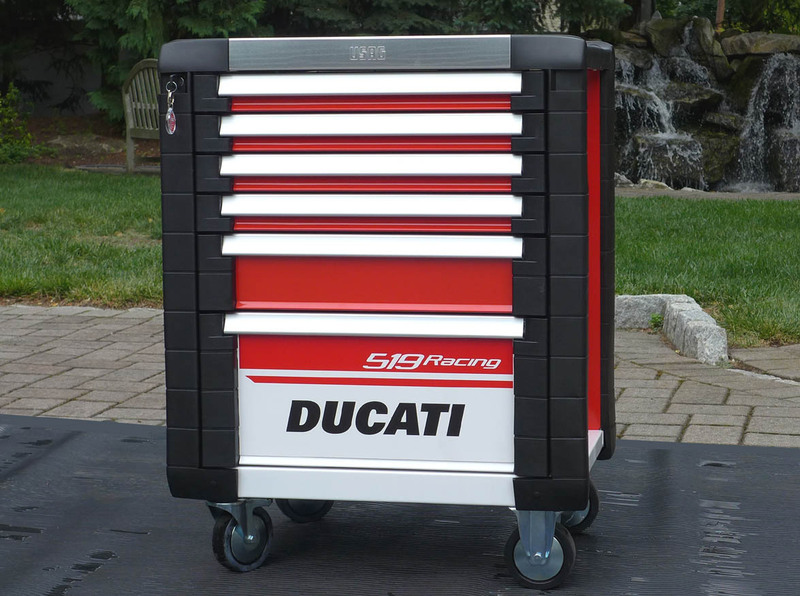 I called my Snap-on salesman to outfit the shop with tools, a compressor and storage and received a painful dose or reality. 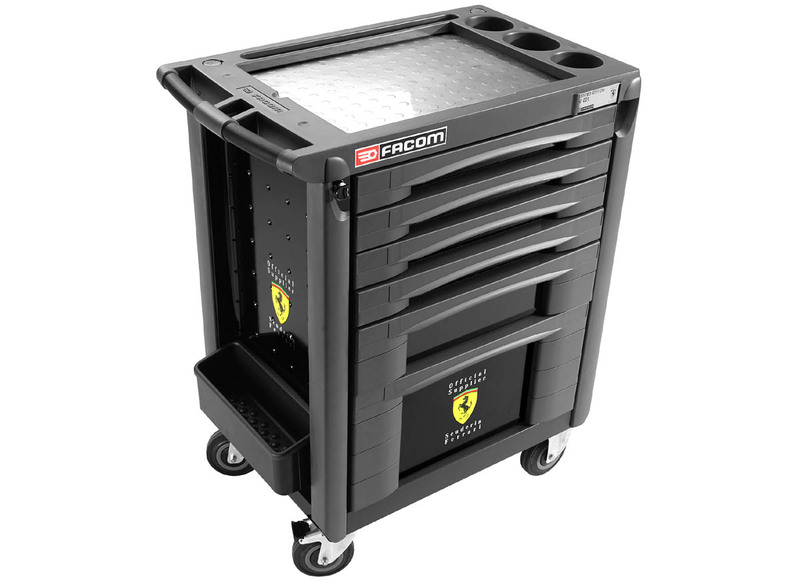 The blow to my budget made me rethink things and I ultimately went with Lista for storage and Facom for tools (both are now Stanley Black & Decker companies). 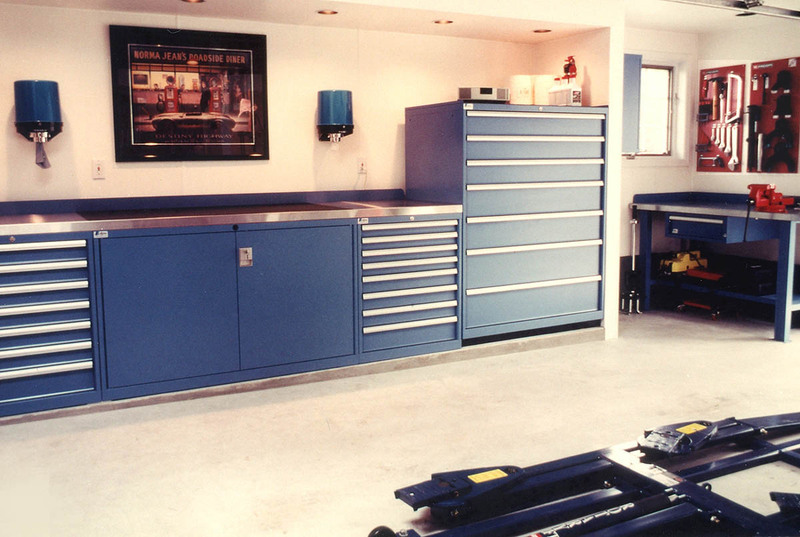 Shop photos in 1997 - Facom wall panels, Lista cabinets, a Rotary low-rise lift, 60-gallon Bel-Aire compressor & Enerpac benchtop press. 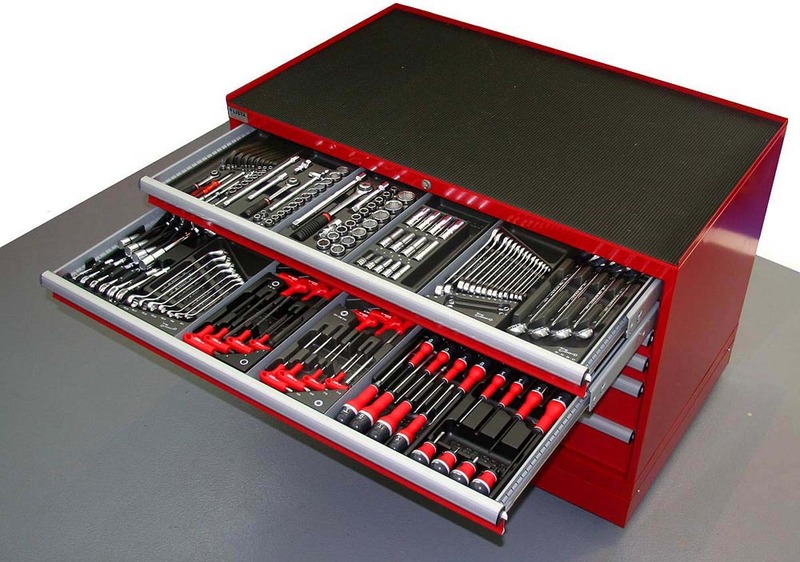 Plenty of tools, hardware and shop supplies in the drawers. Shop photos in 2007 - after the garage makeover. Compressor was now a Kaeser SX6 rotary and the Lista cabinet/workbench layout was reconfigured. Wall panels were replaced with Facom tool module sets and heavily partitioned Lista drawers. 6/03/16 - Famous French Companies - the French have a long time reputation for architecture, design and engineering. I lived in France as a teen, in Neuilly-sur-Seine, just outside of Paris. My experience and memories were mainly of chateaus, churches, cathedrals, museums and architecture. The only serious industrial exposure I had while in France was with planes and trains. The best were Concorde & TGV, both way ahead of their time. 6/03/16 - High Performance Series Impact Wrenches (1" Drive)(NM.3000 & NM.3030) - I sell quite a few large impact wrenches (3/4" and 1" Drive) for export to customers in South America for industrial applications. 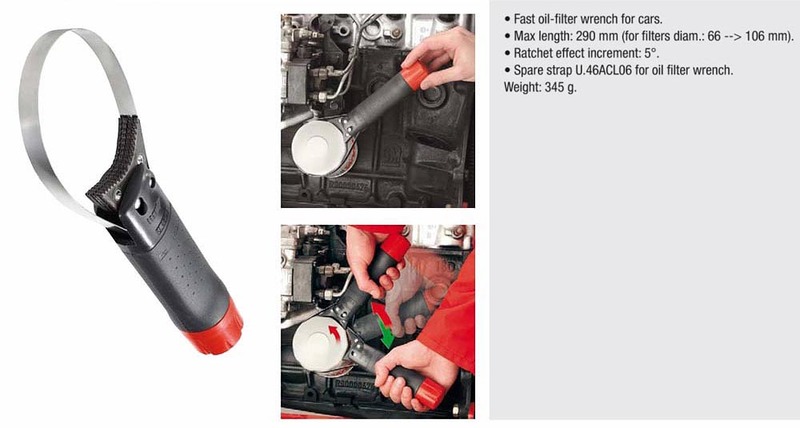 The Facom wrenches are often half the cost of the equivalent spec Ingersoll-Rand tool. Now Facom has come out with a new "High Performance" line of 1" drive impact wrenches, in both a gun style and straight version with either short or long anvil. Their dual hammer mechanisms are rated at a very impressive 3,390nm of torque (approx 2,500 ft lbs). Dual hammer mechanism with an exceptional torque of 3390 N.m.
2 stage trigger enables the operator to control speed at the tip of his finger. One hand forward reverse switch with two steps in forward and reverse. "Soft grip" over molded injected rubber insulating against cold and vibrations. Rubber bumper protecting the motor housing. "Soft grip" over molded lateral handle adjustable at 360°. Safe: Dual socket retainer: ring retainer hole to use a safety pin. Exhaust blows air away from the operator for comfort of use. 6/02/16 - Pneumatic Needle Scaler (V.352F) - A needle scaler is the quickest way to remove old paint, rust and scale from metal surfaces. 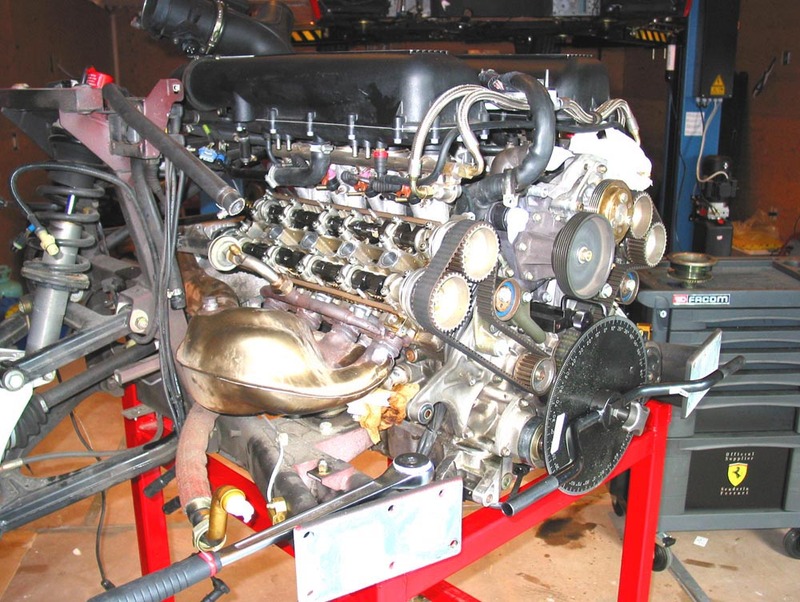 The tool is used in autobody, marine and home repair applications involve metal. I've looked at other Needle Scalers online and there are a lot of comments about quality issues. The Facom V.352F is an industrial grade tool, now available at a much better price....$378.00. Retail is considerable higher at £570 or approx $850+. This unit has been around for years (as a V.352) and has now been refreshed with 2 available needle diameters. 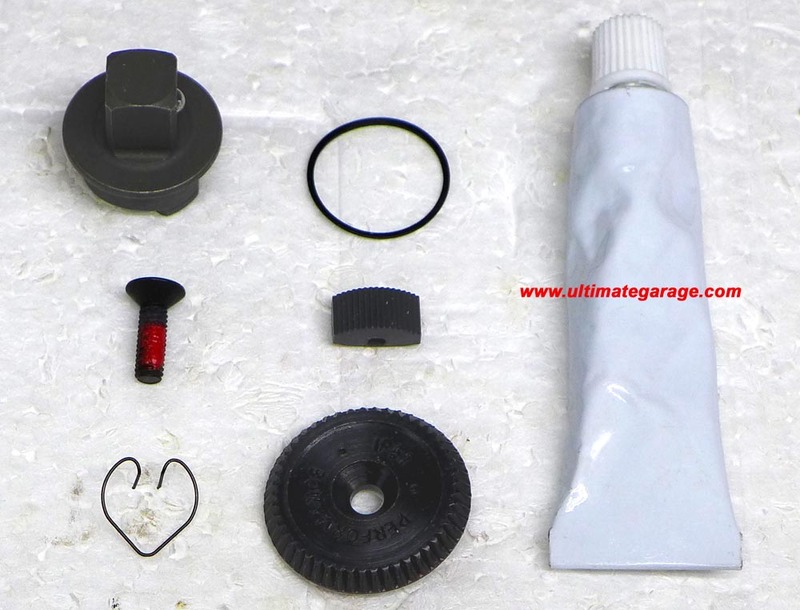 Rebuild parts and replacement needle sets are available through Ultimate Garage to keep this tool in service for years to come. Straight and compact design allows easy operation even in hard to reach areas. 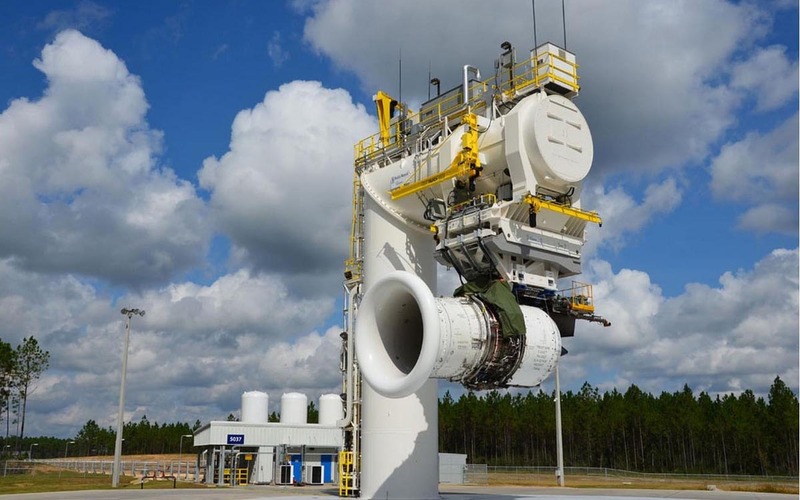 High performance motor delivers 4200 blows per minute for efficient working. Tool used for aggressive material removal for example to remove rust. Needle action great to work on irregular surfaces providing access to cracks or slots. 3 mm needles available as accessory for rougher removal when needed. Delivered with 27 needles diameter 2 mm with matching needle plate. Blows per minute 4200 cpm. Average air consumption 24 l/min. Average air consumption 0,9 cfm. Minimum hose diameter 10 mm - 3/8". 6/02/16 - Facom Air Tools - Facom offers an extensive variety of air tools for automotive & industrial applications. Their design and engineering are unique and build quality is excellent. 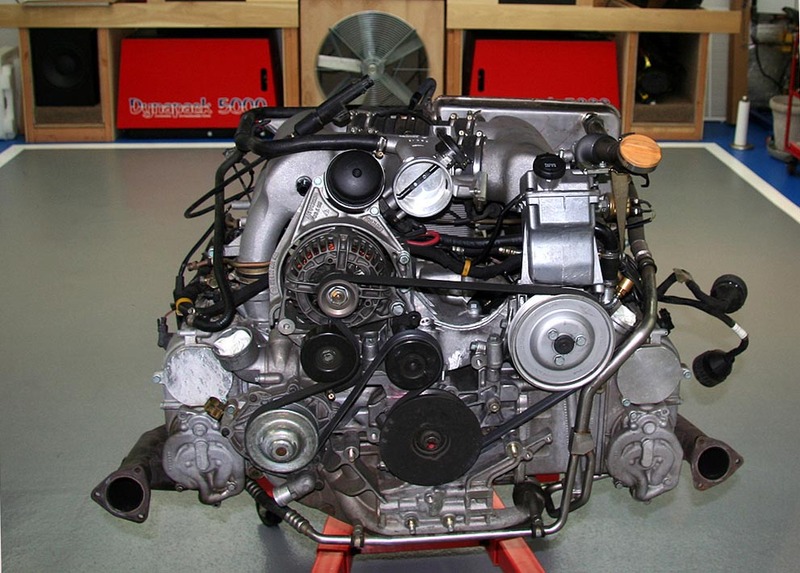 Plus, Facom offers a variety of rebuild parts for most of their tools to keep them working properly for years to come. 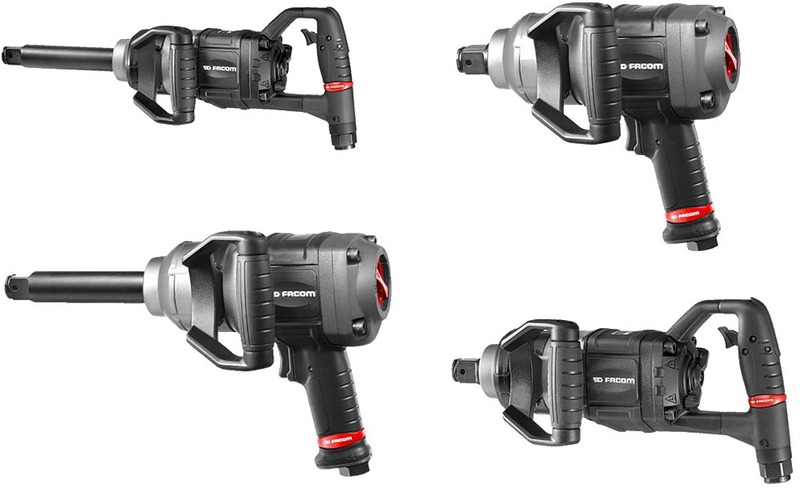 Facom pneumatic tools are very popular in Europe and South America. Here in the states, we're inundated with cheap Chinese throw-away tools. For many customers, especially those who are buying a tool for a 1-time (or limited) use, that may be fine. However, if you use your tools in your job, Facom air tools, especially with the new lower pricing in 2016, should be another consideration. I'll try to touch on Facom pneumatic tools from time to time in this newsletter. 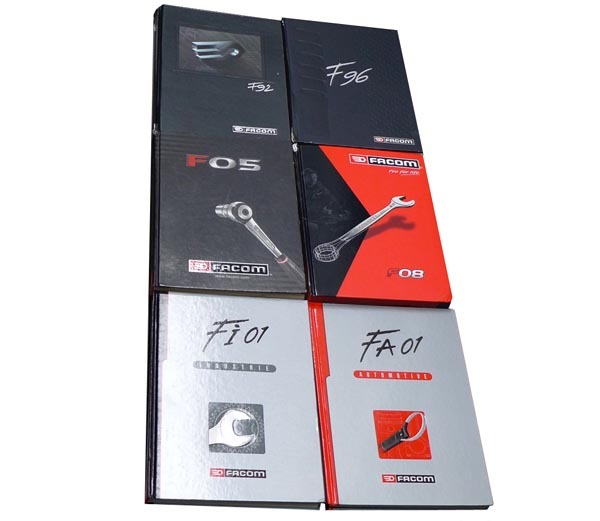 6/02/16 - U.46ACL Filter Wrench - the current strap style filter wrenches from Facom include the U.46, U.46PL, U.46ACL, U.48 and U.48PL (the PL models are for large filters found on trucks, SUV's and commercial vehicles). The most popular in this lineup continues to be the U.46ACL fast action filter wrench. I first used this wrench on my Porsche 911. The filter was tucked deep back on the right side of the engine bay. The U.46ACL wrench fit the large Porsche spin-on filter perfectly (range is 66>106mm, 2.6" to 4.2"), and once adjusted, the ratchet-effect made removal of the filter a breeze. 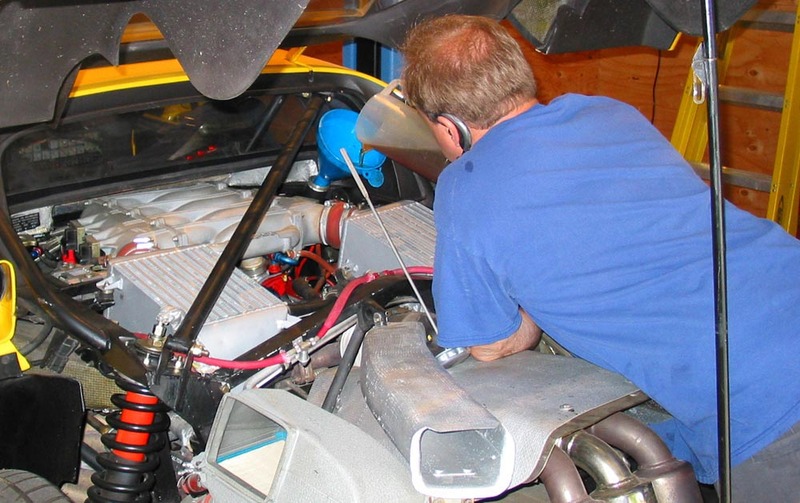 This filter wrench is a must have for any 911/930 owner (at least 911's through 89). The U.46CL was featured in the 2001 catalog and evolved into the U.46ACL by the time the 2005 catalog came out (I have no idea what changed). Facom does offer a fully automatic (self adjusting strap) version but in my experience, the U.46ACL continues to outsell the newer U.48 tool three to one. Facom was wise to keep it in production. The U.46ACL is also popular with boat owners and I have a few marine suppliers who stock this tool. The stainless steel strap may break or wear with time and I stock replacement straps for purchase as needed. 6/01/16 - Shop Photos - Porsche cup car belonging to former Indy winner, Sam Hornish Jr, lived in my garage for over a year. The graphics were all changed by the new owner who raced it for one season. The shop's fume extraction system plugs into ports on either wall. 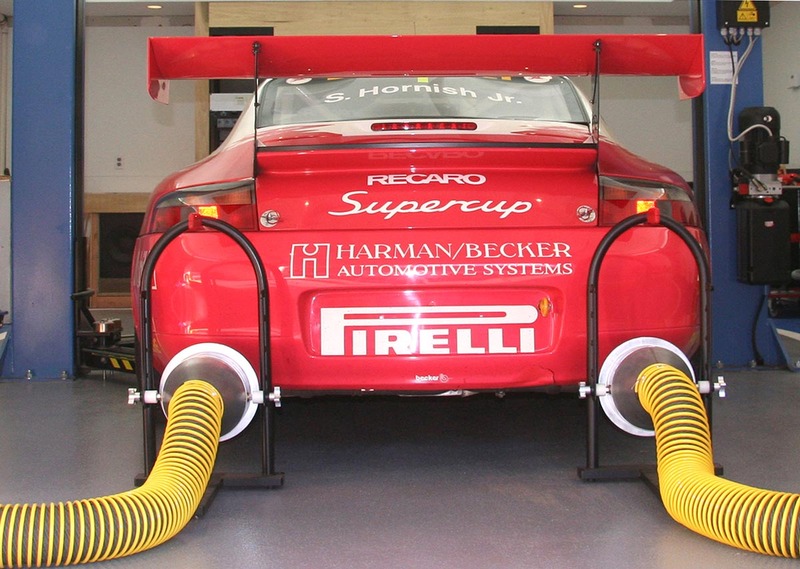 This system was required for cars running on the 4wd Dynapack chassis dyno. 6/01/16 - The FACOM Name - the Facom name is an acronym for "Franco-Americaine de Construction d'Outillage Mecanique" . Now Facom has always been a French company, founded in 1918 by Louis Moses. At the time (ie, the end of WW1), anything linked to America sounded very "professional" so they went with and kept the name. This marketing practice still occurs today. Schwaben and Siegen (Sealey), are 2 tool companies with a very German sounding name.....they aren't. Ironically, in 2006, Facom was purchased by an American company, Stanley Black & Decker. The Franco-Americaine relationship is one of tool ("Outillage") sales & distribution and not joint French/American manufacturing. 6/01/16 - Facom Shop Photos - Grab & Go Tool Drawer #1 - I keep a variety of tools, hardware, shop supplies, etc in Lista cabinet drawers in my basement and garage workshops. 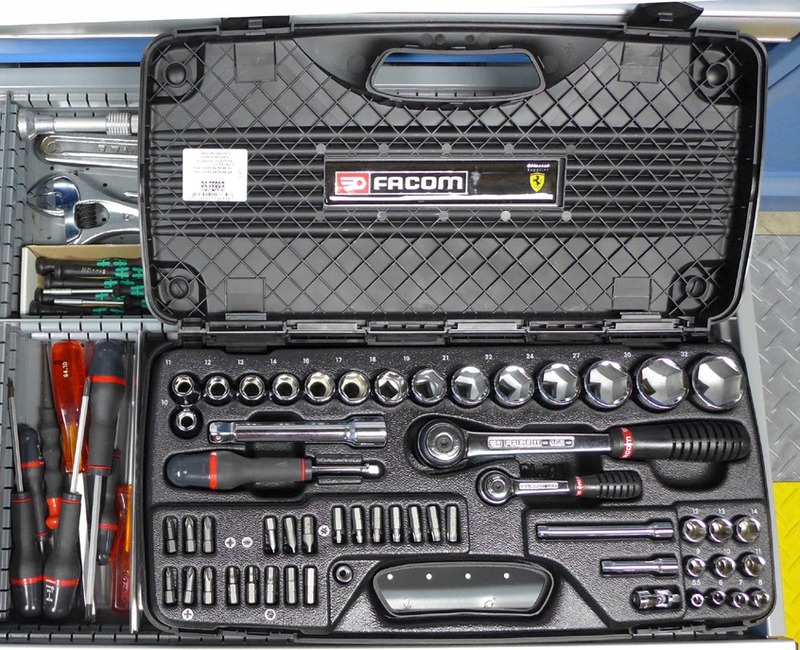 Here's a Facom mixed drive socket set (Facom Ferrari Paddock set), a few Ergotwist & Enduro series screwdrivers, Black series pliers and a mix of adjustable wrenches (6", 8", 10", 12", 15", 24"). There's even an early Gearwrench set (before Facom came out with their 67 & 467 Series) and a Wera micro nut driver set. 5/31/16 - Facom Shop Photos - Ergotwist Screwdriver Panel - this wall panel set was available through SK Tools back in the late 90's. Not sure if it was a Salesman demo set or one for general sale. 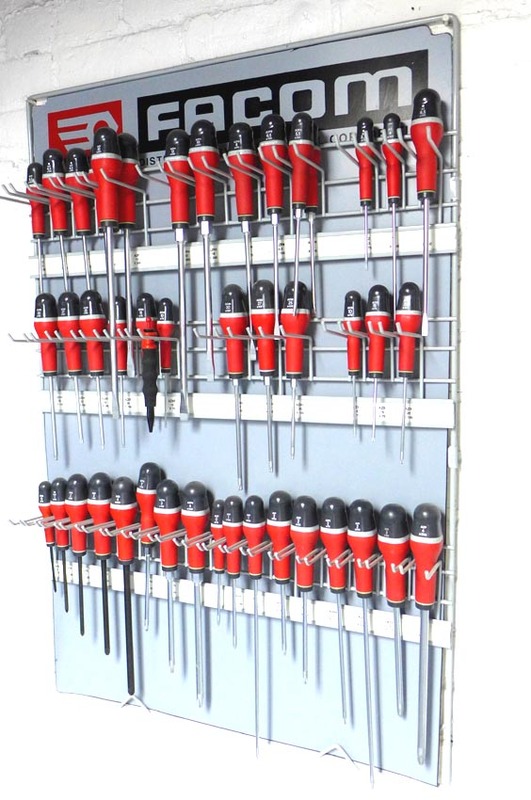 The set included 40+ Ergotwist series screwdrivers plus the wall panel. The Ergotwist was discontinued in 2007 and the Protwist series (replacing both the Ergotwist & Enduro series) first made it's appearance in the F08 (2008) catalog. 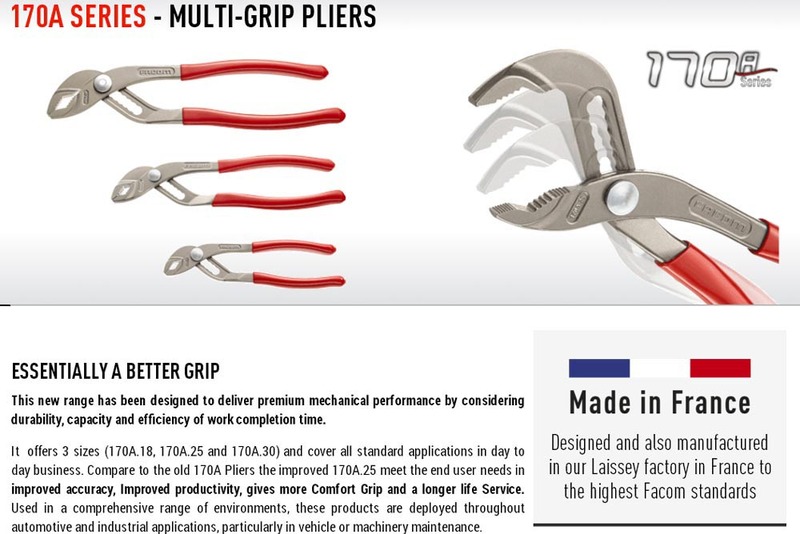 5/31/16 - "Facom Classic" - T5 Trigger Release Locking Pliers - introduced in 1996, the T5 was advertised as the "ultimate" in Lock-Grip tools. This was quite a statement considering Facom's excellent 500 Series locking pliers that had been around since the 70's. 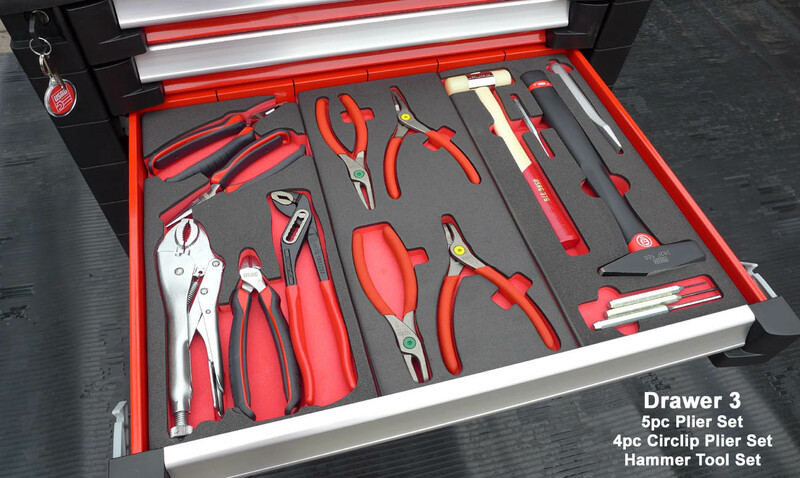 In 2015, Facom consolidated and improved their classic 500 series lock-grip pliers, now called the 500A series. The T5 series (in all sizes & finishes) were discontinued and replaced by the new single setting 501AMP. 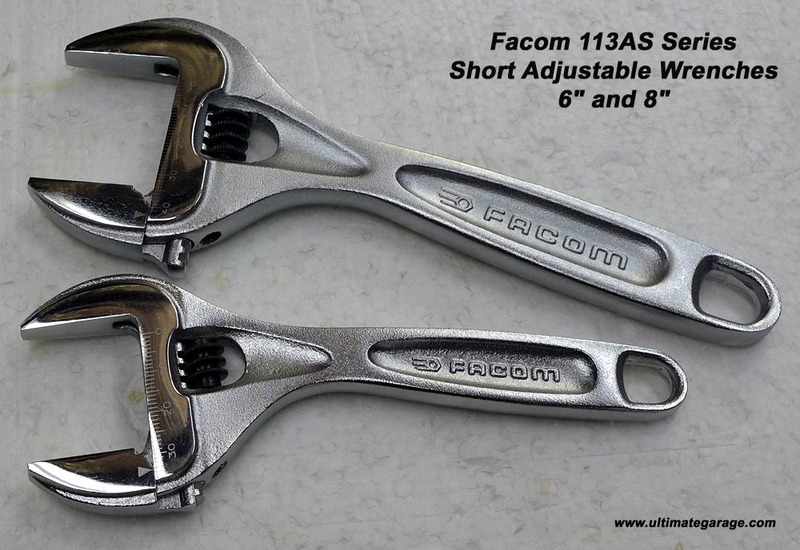 5/31/16 - Facom Ultra-Compact Hinged Ratchet (R.180) - Facom recently discontinued production of their classic palm control hinged ratchets ("flex-head ratchets") and reintroduced telescoping flex head ratchets in 3/8" (JXL.171) and 1/2" drive (SXL.171). 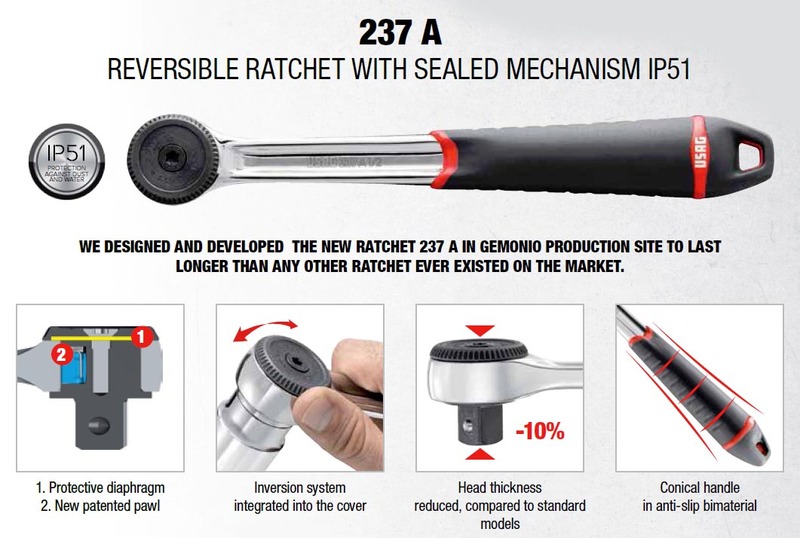 Now in 2016, they've come out with an ultra-compact 1/4" flex head ratchet...the R.180. The R.180 is not a traditional 1/4" drive ratchet....it is a "bit insert ratchet". This eliminates the need for a bit holder allowing the user to get into very tight spots. Sockets can be used with their ECR adapter. The R.180 ratchet comes with a 100mm long magnetic bit holder extension. It can also be purchased as a kit (R.180J31) in a NANO style compact case with extension, socket adapter and 28 assorted bits. The R.180 is the best bit ratchet I've used so far. Still not a fast as using my Festool CKS cordless but definitely a whole lot cheaper and slim enough to fit in my shirt pocket. Flex head locks into 13 different positions. Reversing lever on the ratchet head. R.180 is a big improvement over the traditional 1/4" ratchet with bit and bit holder. I still prefer traditional ratchets for socket use. The ECR adapter with the R.180 allows you to use 1/4" sockets but its a bit wobbly, like using any socket on the end of an extension. 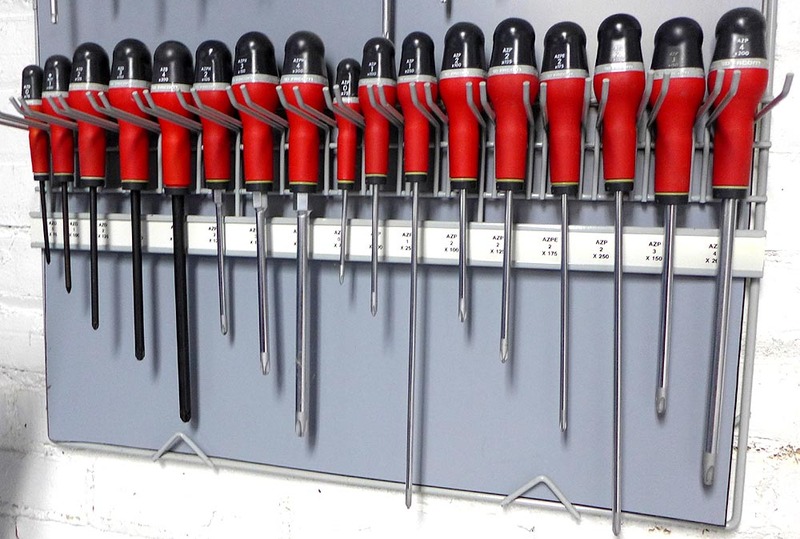 5/30/16 - 440 Series Combination Wrenches (Gen 2) - the 440 series combination wrenches first appeared in the 2008 catalog, replacing the long running 40 series. Facom essentially slimmed down their old 40 series, making it more comfortable in the hand and offering improved accessibility at both ends. 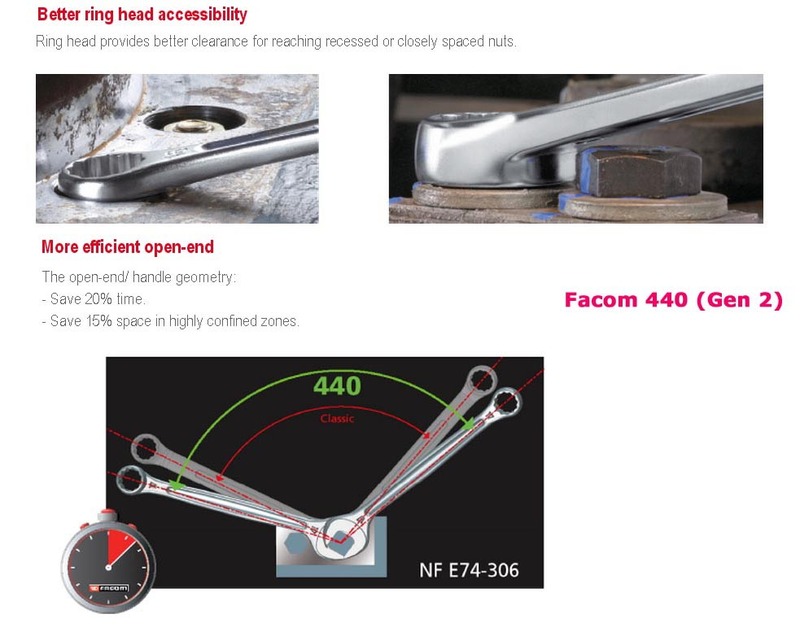 In 2014, the engineers at Facom made further improvements to the 440 wrenches, making the open ends up to 15% slimmer for even better access to fasteners. 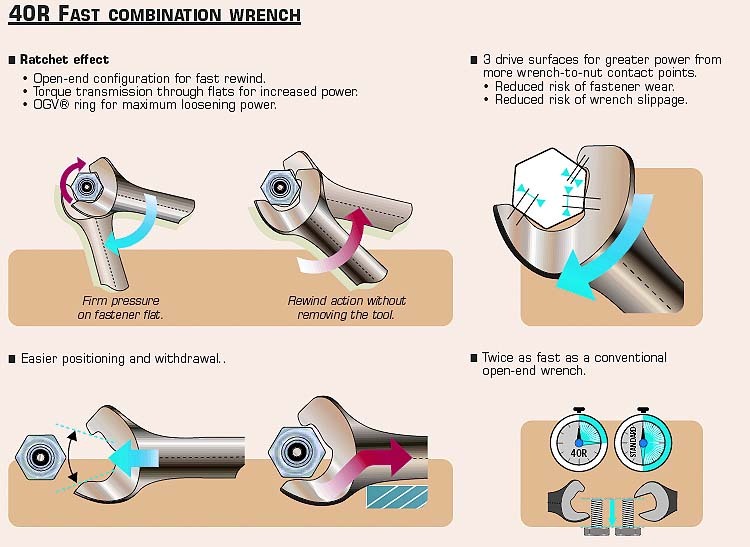 See pictures below on how to quickly distinguish between early and late 440 series wrenches (Gen 1 vs Gen 2). 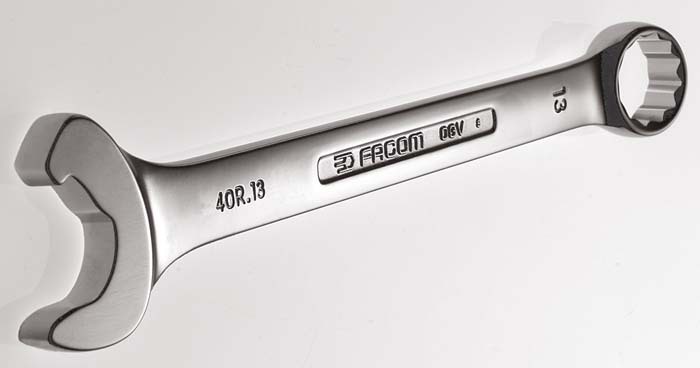 5/30/16 - Facom General Purpose Micrometer ("click-type") Torque Wrenches - this is the most popular style torque wrench for general automotive and engineering applications. 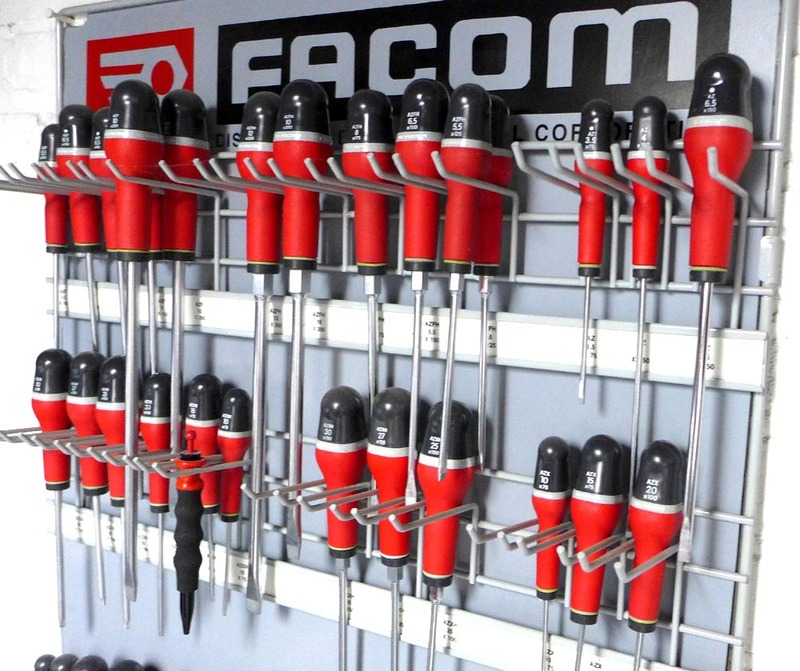 All current Facom torque wrenches are made in Italy of France and certified (COFRAC) in France. These wrenches typically test much better than the +/-4% specification. Facom S.208-200 with storage tube and COFRAC certification. 208 Series - In 2005, the 206 and 206 series were replaced by the new 208 series. New feature was a coarse and fine vernier torque adjustment plus a new "A" version with detachable head to allow the use of other torque wrench accessories. 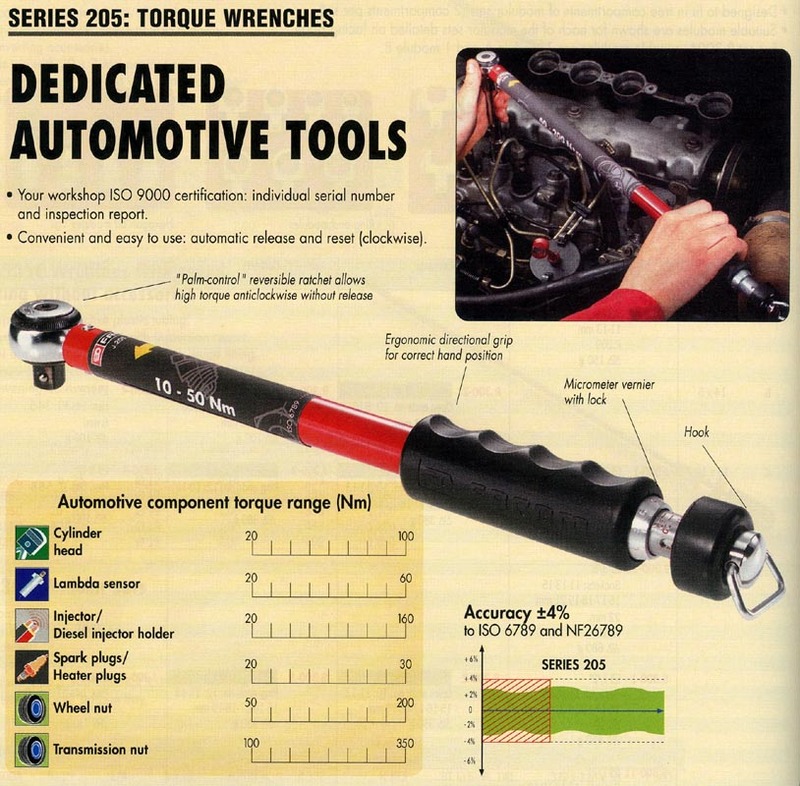 206 Series torque wrenches first appeared in the 1996 catalog. They included the same mechanism in used in the higher end 305 series but had a more compact fixed ratchet head. 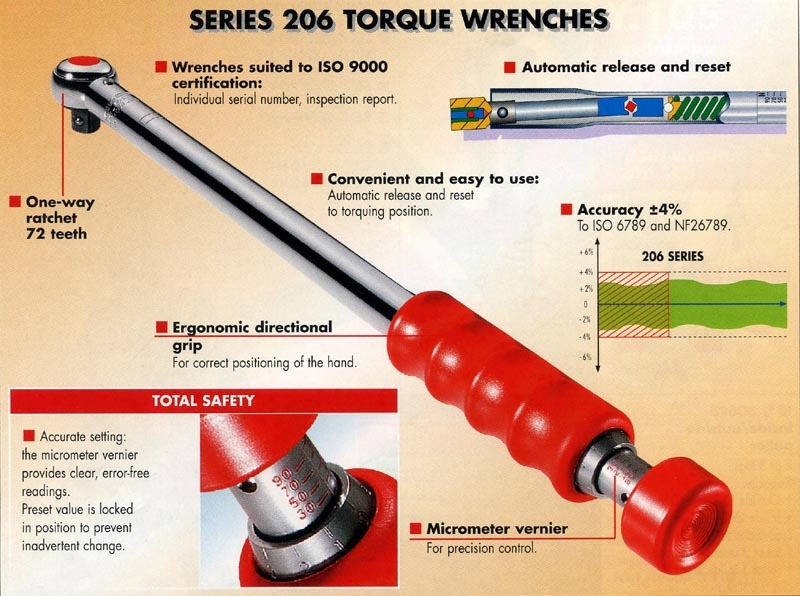 The 305 Series head was detachable and allowed the use of other torque wrench accessories. Both 206 and 305 series were certified to +/-4% accuracy. 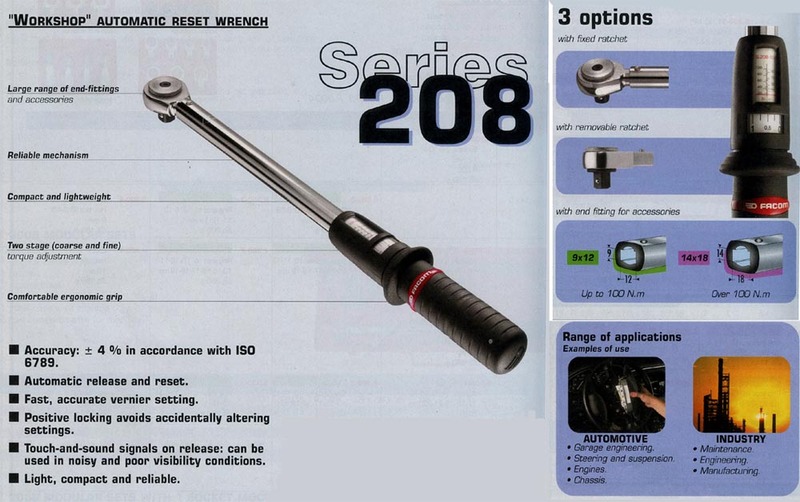 The 206 series was a 1-way wrench. So was the 305 although I did receive several calls back in the day from customers who claimed their wrench only worked in reverse (turns out they had installed the detachable ratchet head upside down on their torque wrench). 5/30/16 - Facom Catalogs - Facom was founded in 1918 and in their almost 100 years of existence, they have only published 15 full catalogs (catalogues)....the first one in 1924 and their last one in 2013. The current F13 catalog is quite large at 1000+ pages. The full 2013 catalog is available online. 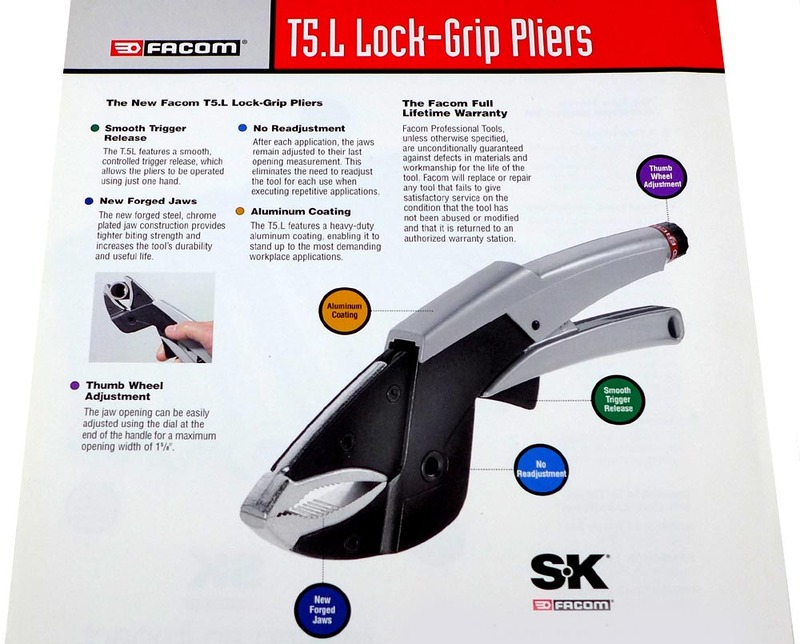 Facom owned SK Hand Tools and used them for US distribution through 2005. 5/29/16 - 17mm Convex Wheel Socket (NSB.17) - for Mercedes - Facom has offered the NSB Series of convex thinwall deep impact sockets for 25+ years. They are currently available in 14 metric sizes, from 8mm to 32mm. They are especially effective for working with wheel lug bolts/nuts as the contact the hex fastener on the flats rather than applying torque through the points. This helps prevent damage to the lug fasteners, including expensive aluminum and plated ones. In 2006/2007, Mercedes started using a flower head (convex) lug bolt on their high end Maybach and S-class (W-221 series) cars. The factory tool set from Maybach to their dealers included a the Facom NSB.17 (17mm) socket for the safe removal and replacement of these "flower head" wheel bolts. The polished aluminum cover on these bolts easily deforms, especially when shop technicians use impact guns for Removal & Replacement. 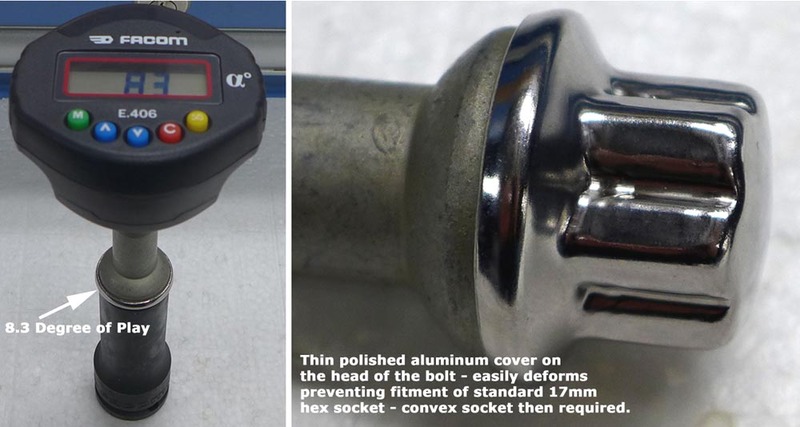 Once the cover is deformed, a standard 17mm hex socket will no longer fit on the bolt. I've shipped numerous sockets to customers and shops, often with overnight delivery, so they could remove the wheels on their Mercedes to repair or replace tires. Mercedes now uses these bolts on many of their cars, from GLK, M-class, E-class, CL and still the S-class. Unfortunately, they do not supply the appropriate convex socket with the vehicles or as a tool for purchase through the parts departments. If you own a Mercedes, check your car to see if it has these bolts. If so, I strongly advise you purchase one of these sockets to keep in the trunk with your spare tire. Fitment Comments - the Facom NSB socket intentionally has a looser fit (8-9 degrees of play between the bolt and the socket) compared to the tight fit with a standard hex socket (3-4 degrees of play). The thin polished aluminum cover on the Mercedes bolts is easily deformed from the torque and impact blows during R&R. Once the cover is deformed, the tight fitting hex socket will no longer fit the bolt. The convex socket will be now required to remove the lug bolt. Facom SXL.180 Telescoping Breaker bar takes up very little trunk space. This socket will have to be used with some form of breaker bar (Facom or otherwise). 5/29/16 - "Facom Classic" - 40R Fast Action Combination Wrenches - these were introduced by Facom in 1995 and appear in the F96 catalog. 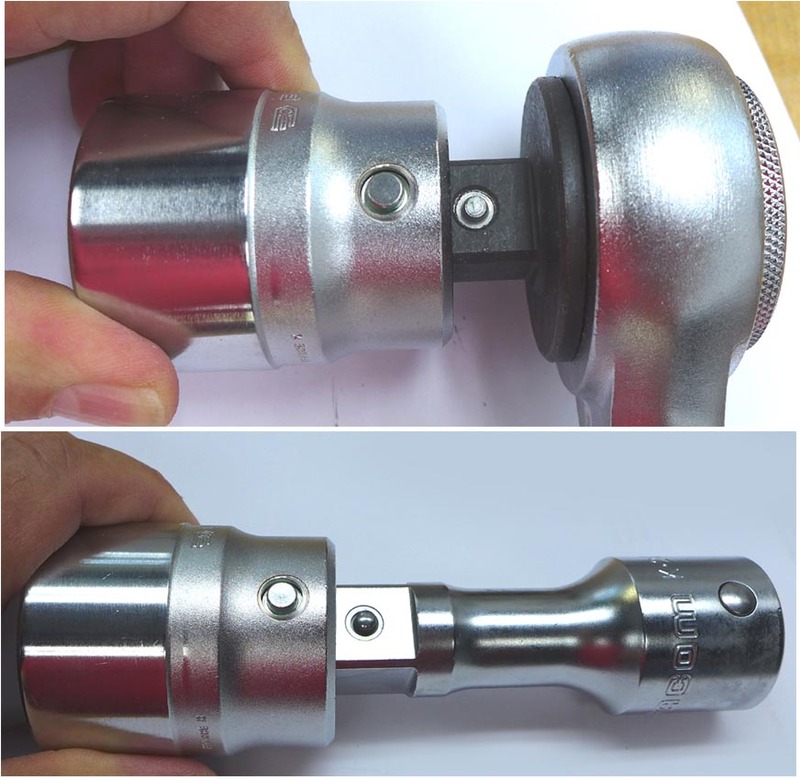 This wrench used a stock 40 Series box end with a specially modified open end to give a fact-action ratcheting effect on fasteners and fittings. They were available in 17 metric sizes, from 8-24mm and later, thanks to their ownership of SK Hand Tools here in the states, 12 fractional sizes from 5/16" to 15/16". I found these very useful when working with captive fasteners....HVAC and plumbing fittings, coaxial cable ends, etc. 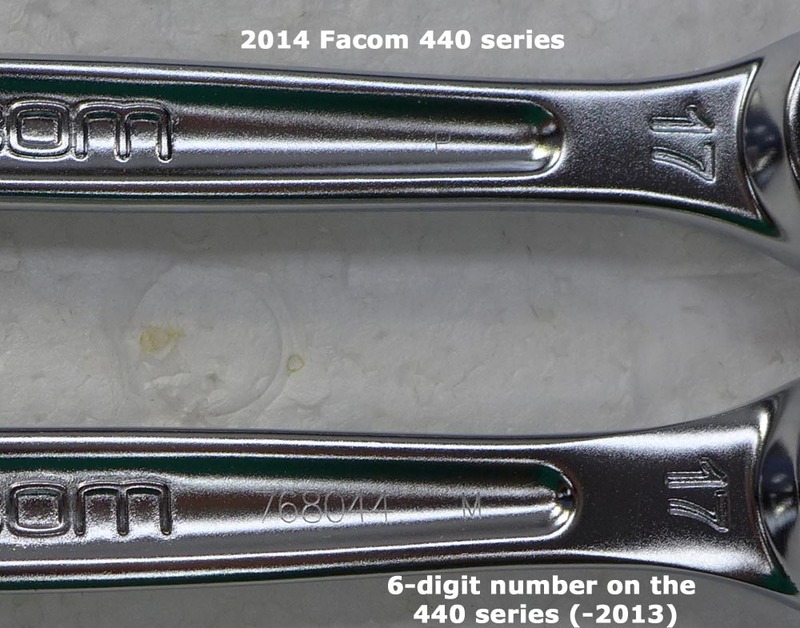 Unfortunately, Facom discontinued this series in 2014 and replaced it with the 467R series. The 467R is a better wrench, but because of the ratcheting box end, it comes at a higher cost. And the contractors who were buying these were mostly interested in the fast action open end. 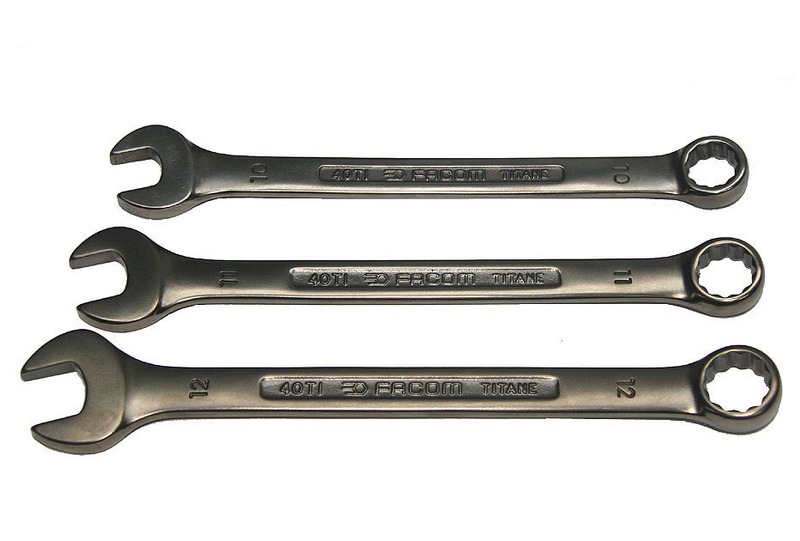 I still have stock of 40R wrenches in a few sizes (see online store) . Facom's 40R series - the open end design allows fast rotation....the tool can be positioned for the next turn without removing it from the fastener. Technical Advantage - 3 drive surfaces for greater torque application - more wrench-to-fastener contact points. 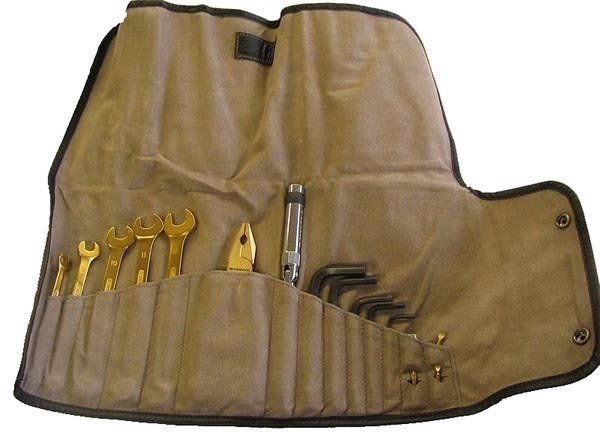 Reduced risk of fastener wear and less chance of wrench slippage. 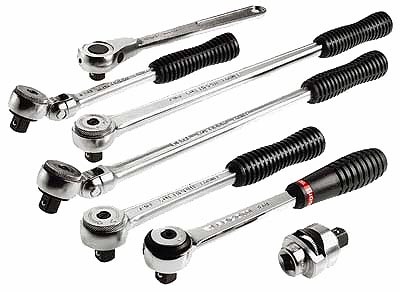 Ratchet effect is twice as fast as any conventional open end wrench. 5/29/16 - "Facom Classic" - 40ti Titanium Combination Wrenches - Facom produced titanium combination wrenches (40ti Series) in a few sizes during the production run of the McLaren F1 back in the 90's. Even at distributor pricing, these wrenches were expensive, costing the dealer roughly $100ea per wrench (6mm, 8mm, 10mm, 11mm & 12mm). 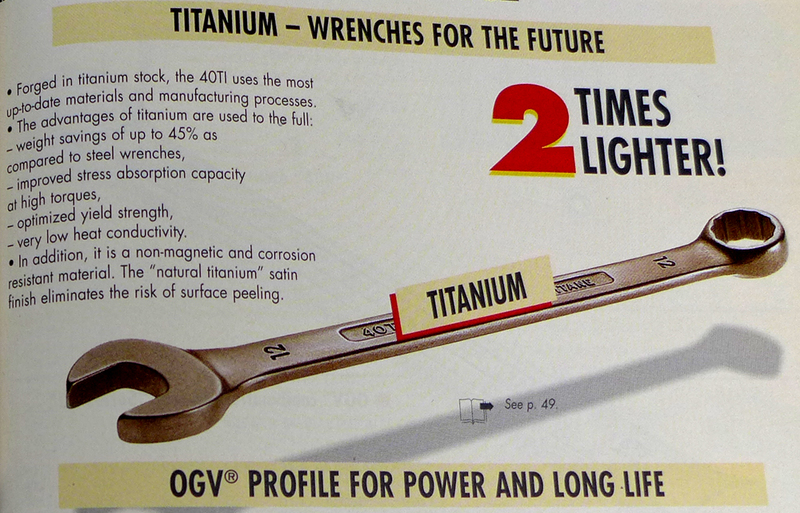 Early wrenches had flaking problems but this was fixed by the time the F96 catalog (1996) was printed. I gave 50+ of these away to good customers back in the day and still have a few for my own collection. 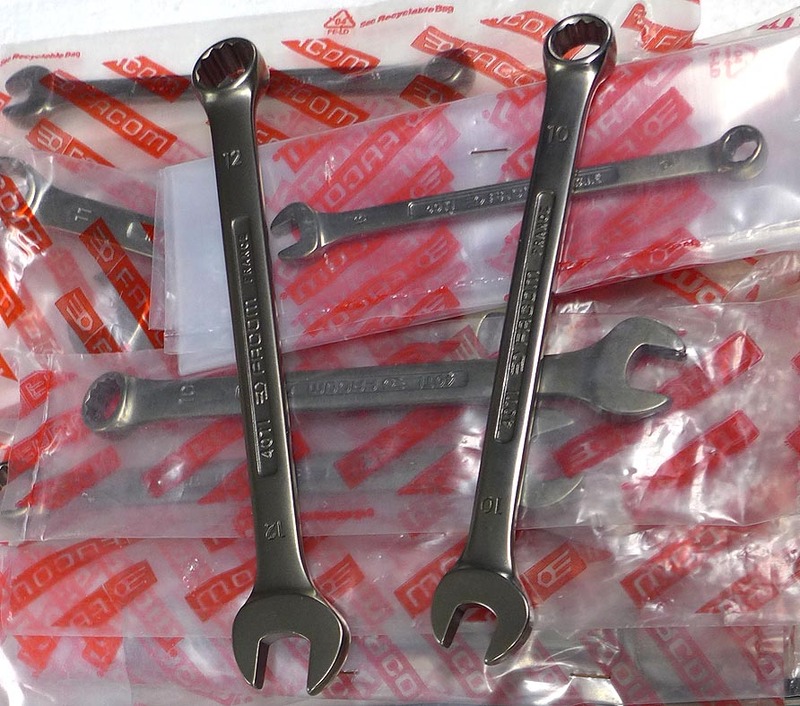 These are later production wrenches with a natural titanium satin finish that eliminated the flaking/peeling problems. 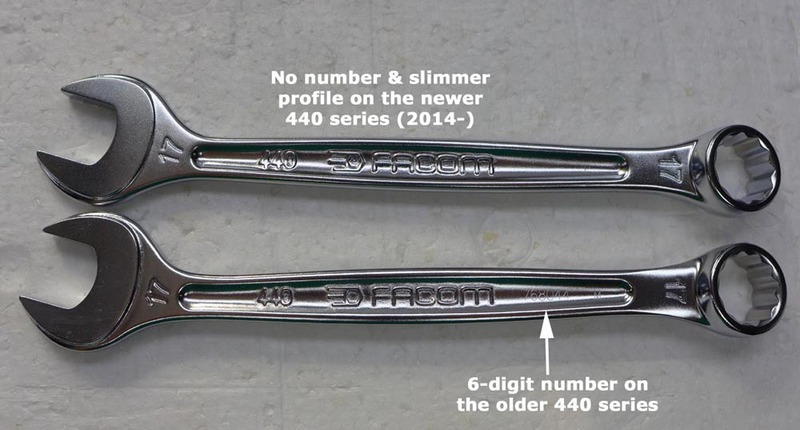 5/28/16 - Facom Slim Profile Wide Opening Adjustable Wrenches - new in 2015. I recently had to replace the cartridges in a pair of Danze faucet sets in my kitchen and had problems finding a compact, wide spread wrench to do the job. Most plumbers I've worked with keep a set of large multi-grip water pump pliers in their tool bucket for jobs like this and tend to chew up the brass edges of the locknuts taking the faucet apart. An adjustable wrench is better but to accommodate a 30-40mm spread, you've got to use a large 12" or 15" adjustable wrench. I was just about to cut down a 12" adjustable when Facom came out with 2 new short adjustable wrenches- a 6" (113AS.6CPB) and an 8" (113AS.8CPB) . The 6" version is only 160mm long but will open to 34mm (1.3") (same spread as their 12" adjustable wrench). The 8" version is 200mm long and will open to 41mm (1.57") (max on a 15" wrench is only 3mm more at 44mm). These 2 wrenches are great for plumbing, HVAC and other tasks where you don't need a lot of torque, just "wide spread" and access to the flats of the fasteners. 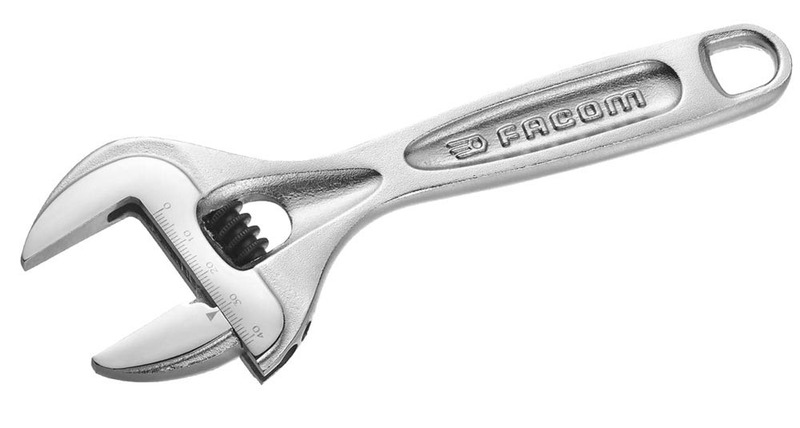 5/25/16 - Facom Ratchets - Facom has been known for their exceptionally smooth palm-control ratchets and has even shared this design with its sister companies over the years (ie, the round head 72-tooth ratchets of SK, Proto and Mac). 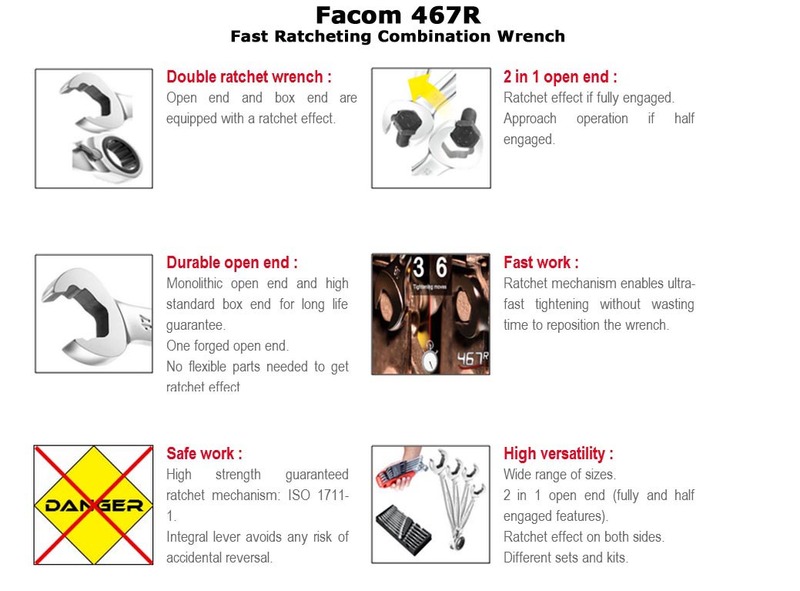 In the past few years, Facom has been moving towards maintenance free ratchets...first the fast action/twist handle ratchets (R.360/J.360/S.360) and later the pear head 161 and 171 series. 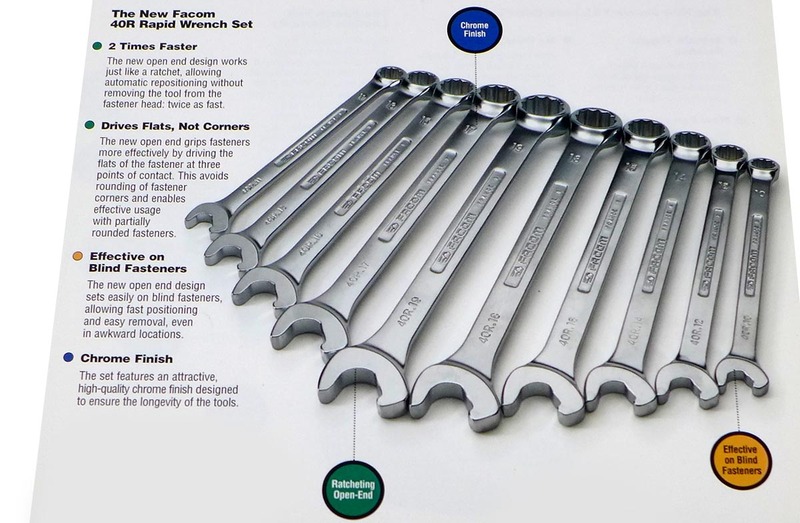 Facom has killed off some of their popular variations in 2014/2015....the stubby ratchets, long ratchets, flex head and metal grip ratchets. With the exception of the old long handle/palm control J.161L, I really don't miss any of the ones that have been discontinued....the new ones are really nice! 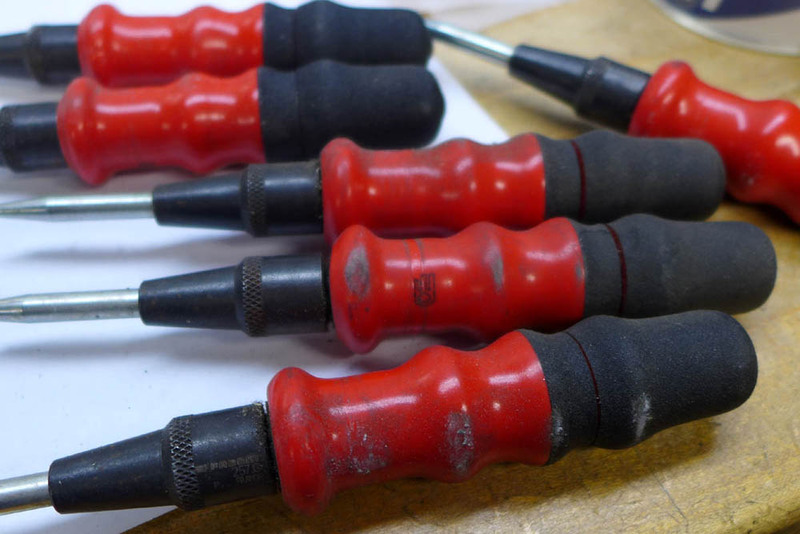 The basic 161 palm control ratchets with the rubber grips are still available along with some new Master Repair kits to keep them working properly for years to come. 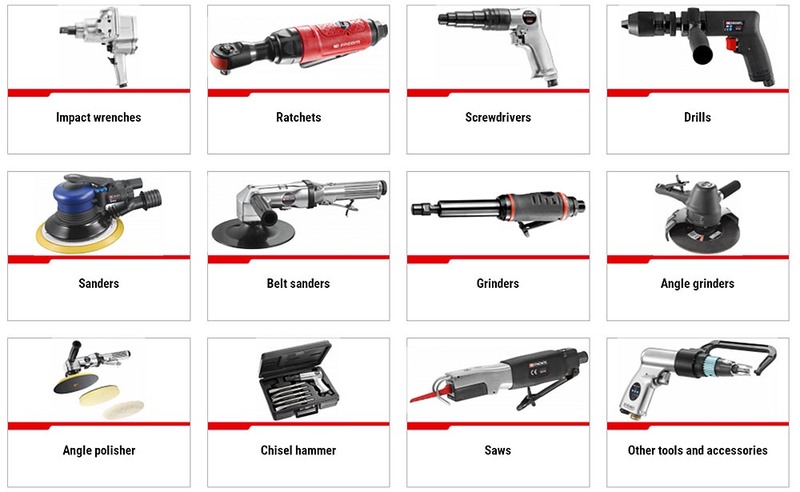 Most popular right now are the pear head ratchets, rotator ratchets and extendable ratchets. Least popular are the standard 151 series ratchets (I keep very few of these in stock). Here are the current ratchet offerings from Facom along with the ones that have been recently discontinued. I still have stock of some of the discontinued listings....check the Master Inventory & Price Sheet for availability. Facom also makes Spark Resistant (SR series) and Fluorescent versions (with & without RFID chips) which are not addressed below. 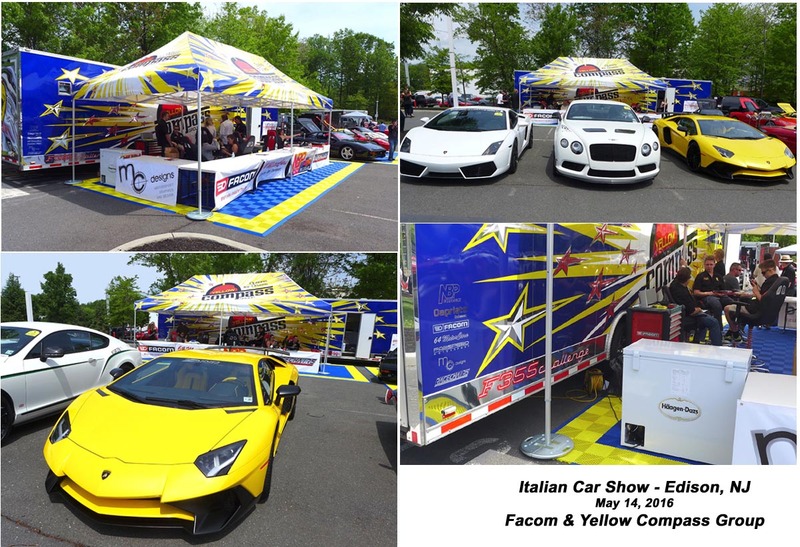 5/14/16 - Italian Car Show (Edison, NJ) - Facom showed up at a recent car show, sponsored by Yellow Compass Group and Ferrari/Maserati of Central NJ. 4/15/16 - Facom Items Discontinued by Ultimate Garage - add the items below to the list of Facom tools that I will no longer import, because of either quality issues or delivery problems. 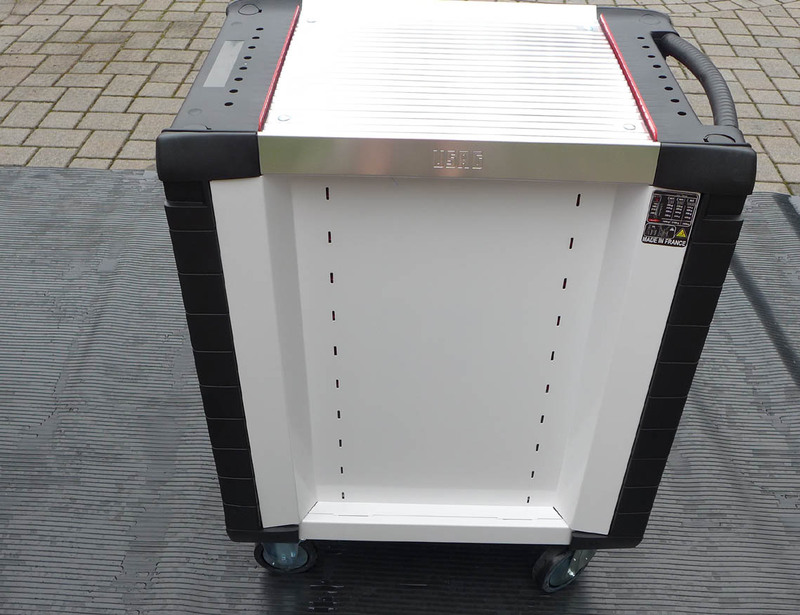 JET.A8POWER - JET side cabinet for power tools - not packaged very well by Facom. Very high probability of damage in transit from France. 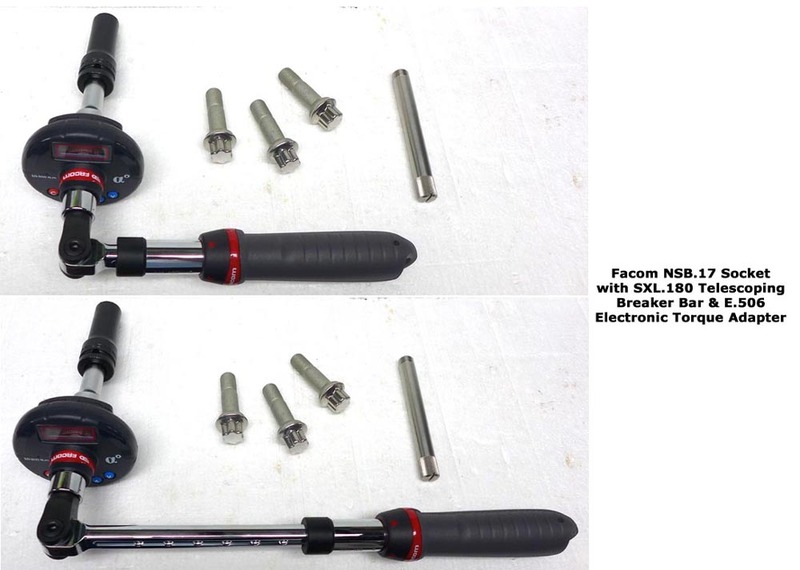 4/01/16 - Facom Palm Control Ratchets & Repair Kits - Facom's palm control ratchets enable the user to apply steady pressure in line with the fastener without switching the ratchet direction. Torque is transmitted through 17 teeth in mesh for improved load distribution through the tool. There are a total of 72 teeth for precision access, ie, 5 degree increments. The teeth are heat treated. The 161 ratchets have been around since the mid-90's. Same rubber handle and satin chrome finish. They are currently manufactured at Facom's USAG plant in Italy. Previously they were made in France. Stanley's Mac and Proto divisions also offer round head, 72-tooth palm control ratchets, made in same plant in Italy. The repair kits for these ratchets (plus some of the older SK palm control units) are the same ones made by Facom. 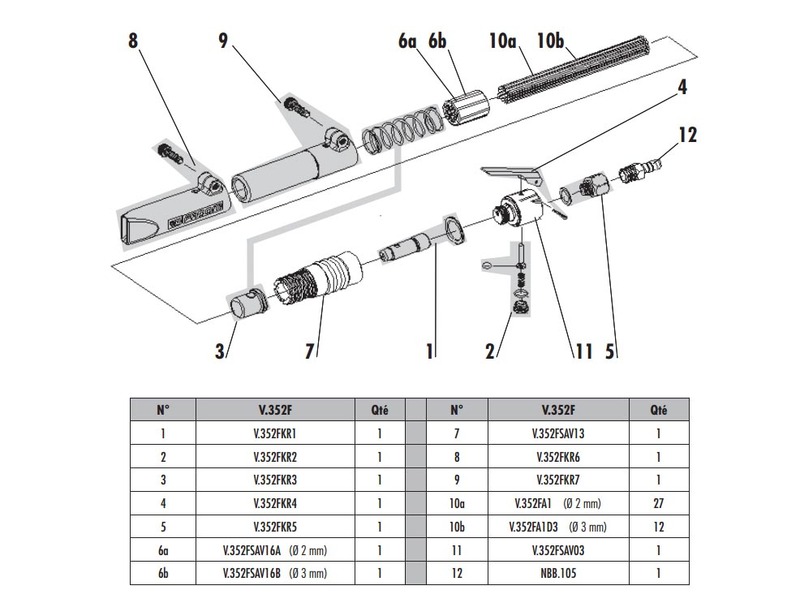 Ratchet Maintenance - Facom fine tooth ratchets must be cleaned and lubricated per the printed sheet that comes packaged with the tool (or tool set). It is common for the factory grease in the ratchet head to harden with lack of use or environmental exposures causing the teeth in the ratchet and pawl to slip or seize. I have found that this grease can be loosened by spraying penetrating oil (WD40, Rost-Off, Kroil, PB-Blaster, etc) into the gaps between the ratchet body and the rotating square drive and working the ratchet in both directions to disperse the oil. If this doesn't work, take the ratchet apart as directed on the maintenance sheet and clean the teeth on the ratchet body and pawl directly with a fine brush. 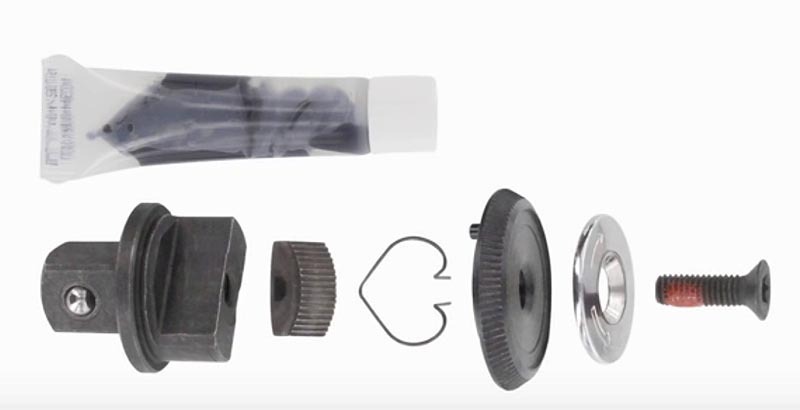 Check the spring tensioning pin on the inside of the knurled cap (if the pin is broken, you'll need a repair kit...R.161C/J.161C/S.161C) and that the "heart-shaped" tensioning spring is intact and positioned correctly upon reassembly (if the spring is broken, you'll need a repair kit....R.161RN/J.161RN/S.161RN). There's also a new Facom online video showing proper disassembly and reassembly of these ratchets. 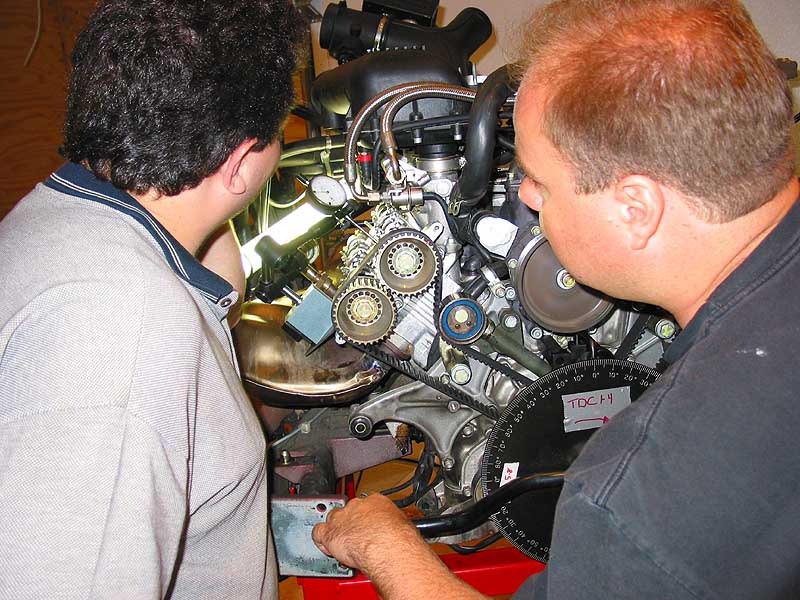 Warranty - in almost all cases, poor ratchet performance or failures are "maintenance issues" (see above). Facom warranty is protection against factory defects...these typically appear upon initial use of the tool. 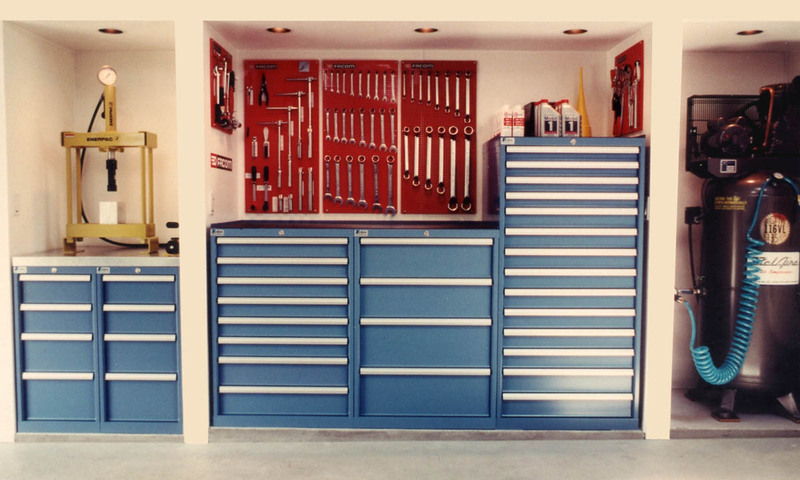 Ultimate Garage will repair or replace any defective ratchet it sells within 30 days of purchase assuming the failure is not due to abuse (ie, using pipe extensions for additional leverage, using the tool as a hammer, etc). 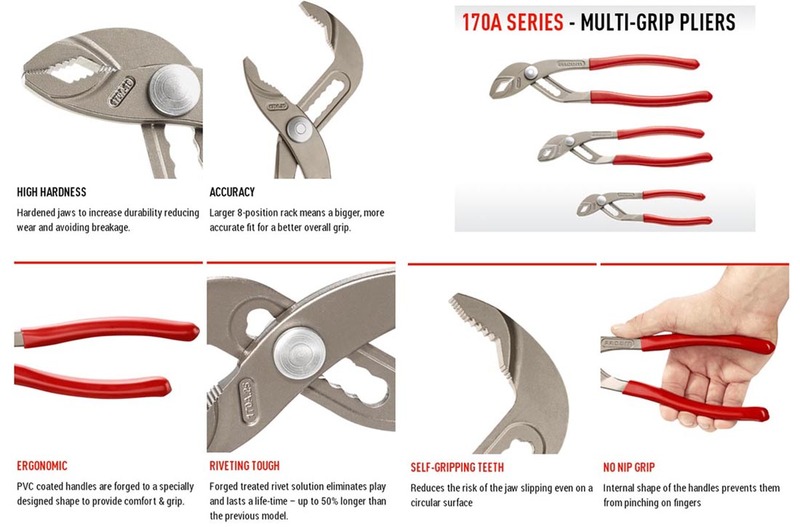 3/1/16 - New Tools - 170A Series Multi-Grip Pliers - very nice quality and finish, especially for such an inexpensive tool. Made in France. I've received the 7" and 10" versions. Still waiting on the larger 12" set to be available for purchase. Much nicer than the old 170A series which only came in the 10" size. Cheaper too! See video. You can order the 170A.18 and 170A.25 through the online store. 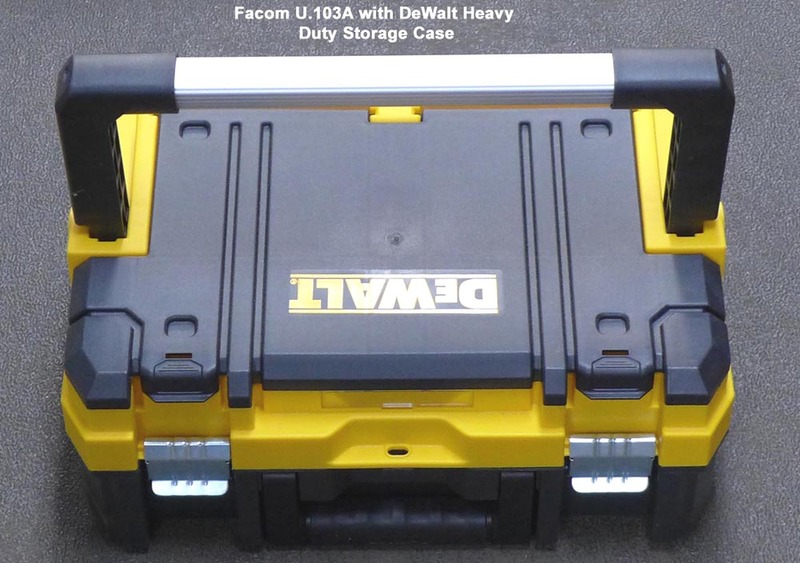 2/10/16 - Facom JET Mobile Tool Boxes - Unpacking & Inspection - useful guidelines for carefully unpacking and inspecting your purchase prior to use. 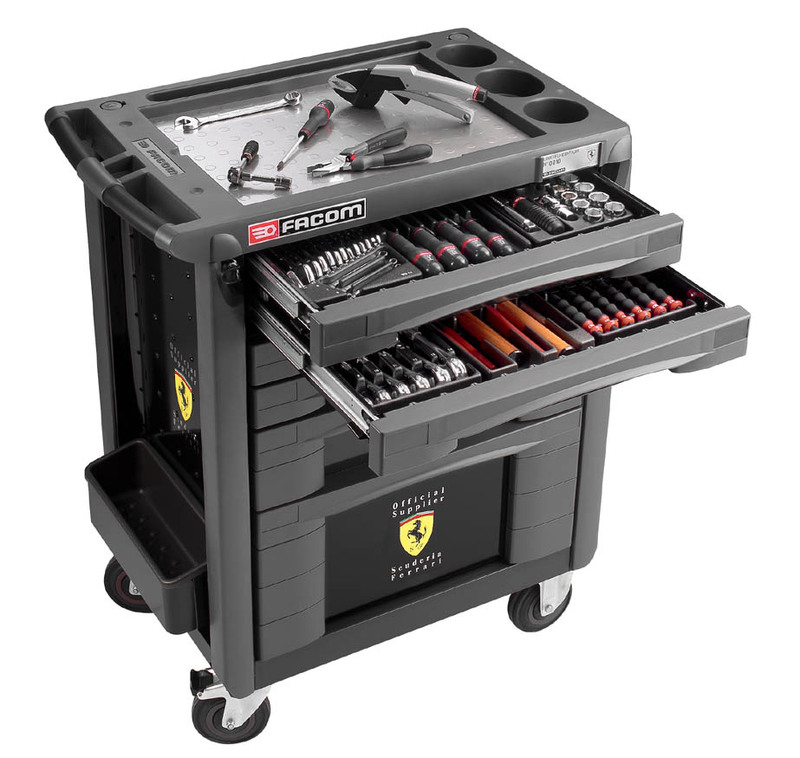 2/01/16 - Facom JET Tool Boxes - Organization & Tool Ideas - a few tool layout ideas using many of the current Facom foam tool modules. 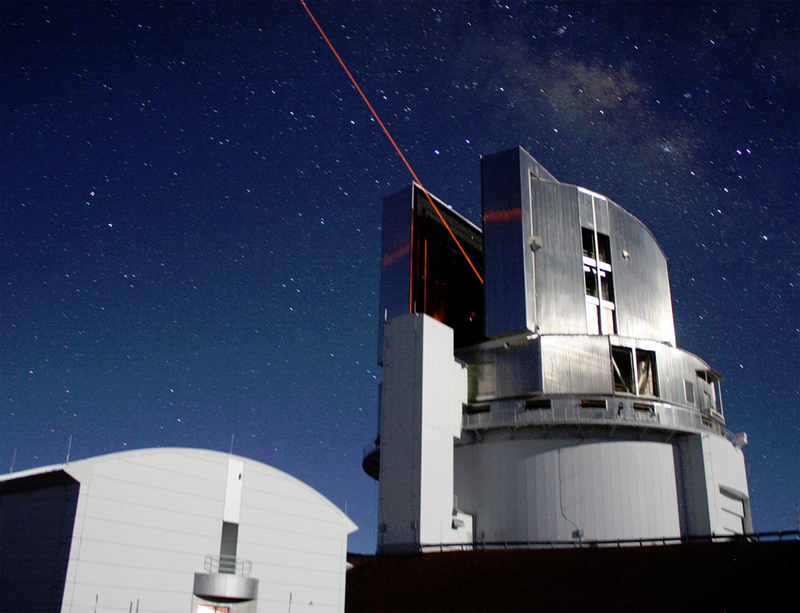 1/30/16 - Facom Tools in Action - Facom 70A Ratcheting Flare nut wrenches used at the Subaru telescope at Mauna Kea in Hawaii. 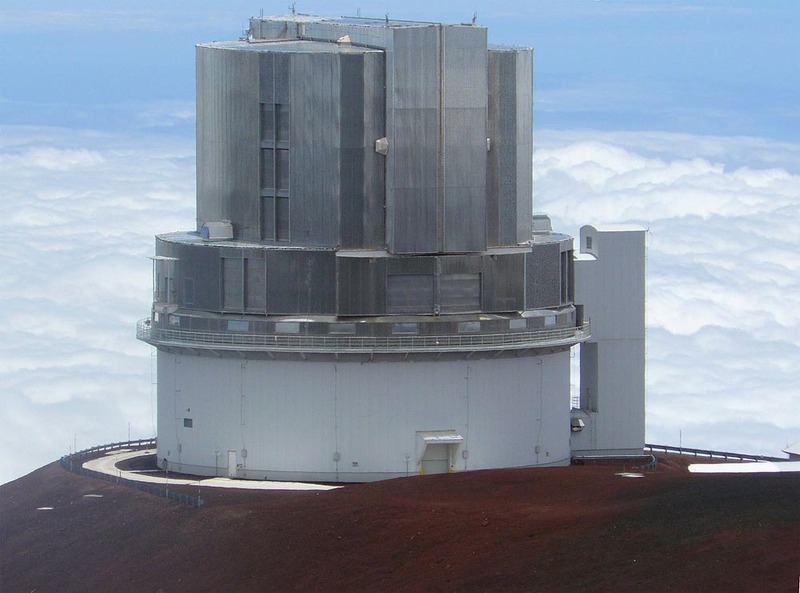 Instruments in the telescope must be cooled to extremely low temperatures using liquid nitrogen and helium, specifically for infrared observations. These ratchet flare wrenches were used as the most effective way to tighten all lines and fittings for distribution of cooling. 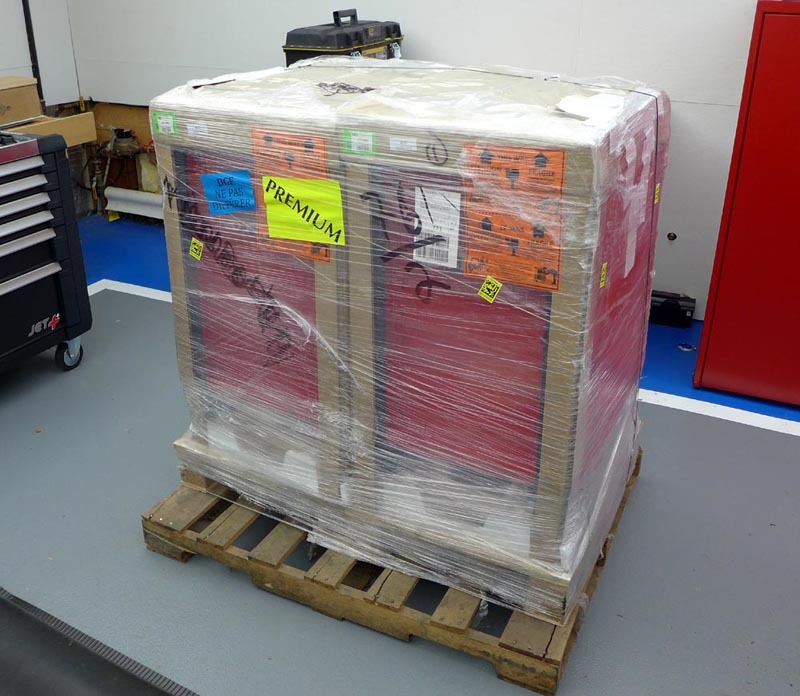 1/30/16 - Facom Tools in Action - Facom 1" Drive 1000nm torque wrenches (K.306A1000) were purchased to secure Rolls Royce engines to the test stands at the Stennis Jet Engine Test facility in Mississippi. 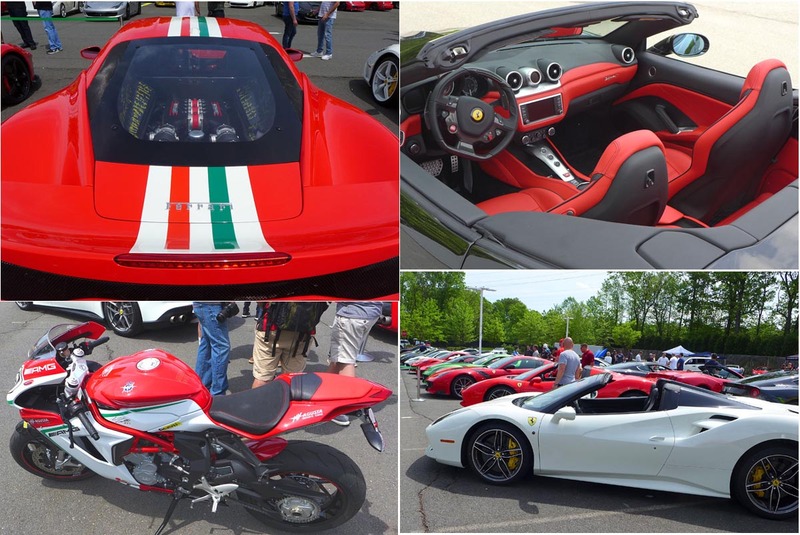 1/30/16 - Facom Tools in Action - 15k Service , Ferrari 355. 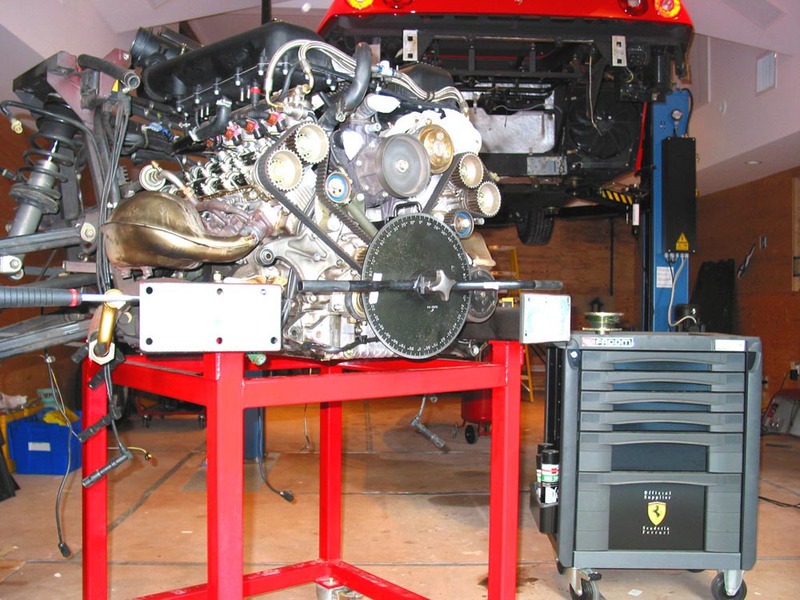 Other than the use of a few specialty tools (mainly for camshaft timing), all of the engine R&R and seal replacements were done with the tools in the Facom/Ferrari collector set.